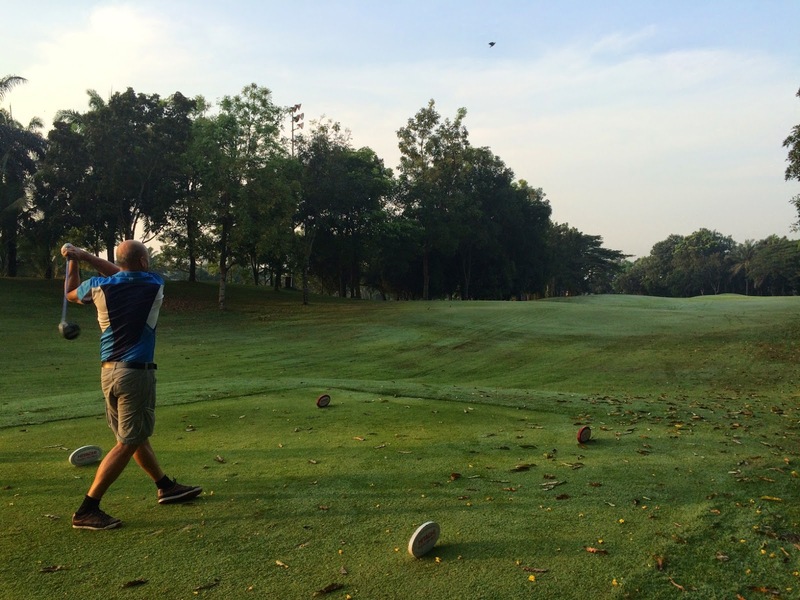 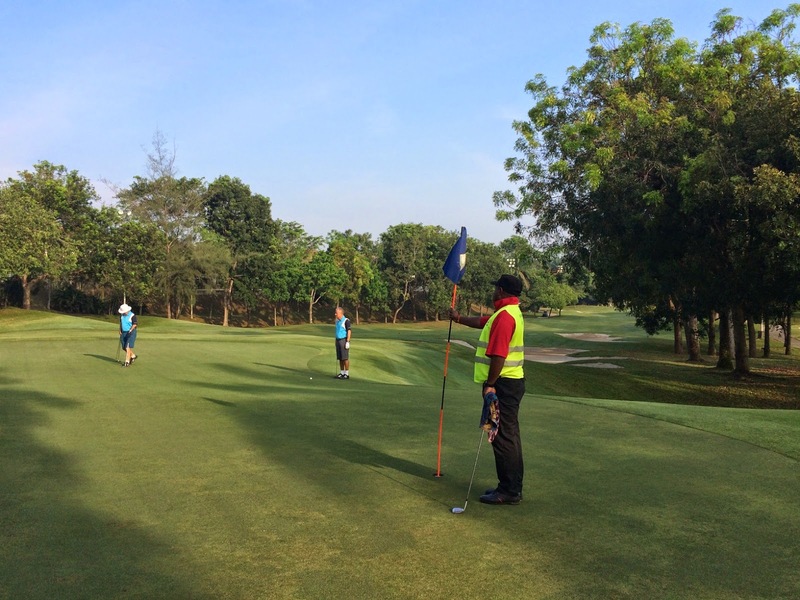 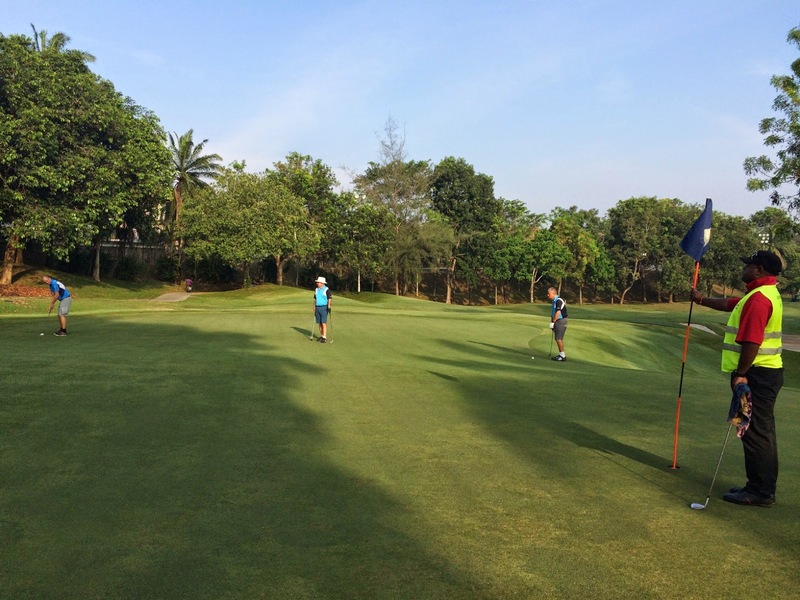 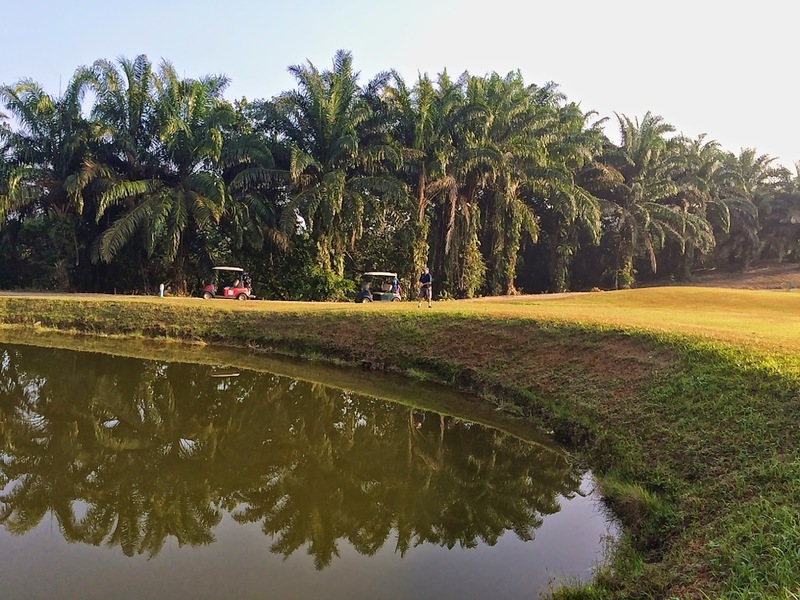 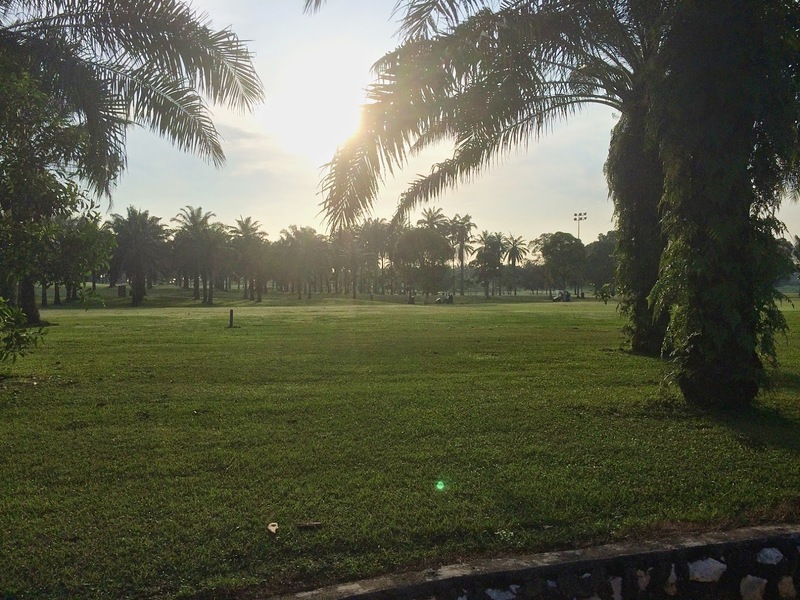 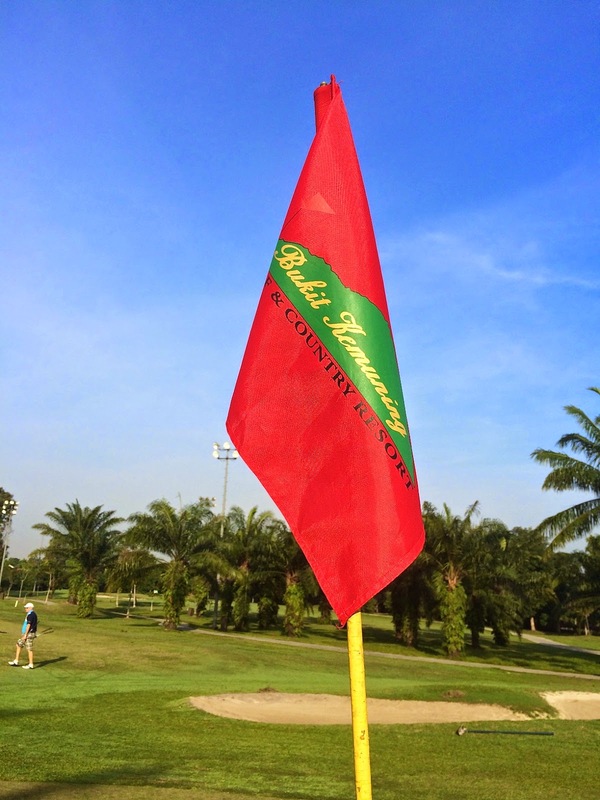 We had 6 full flights today for an excellent turnout for our February Trophy Game at Kota Permai Golf & Country Club. 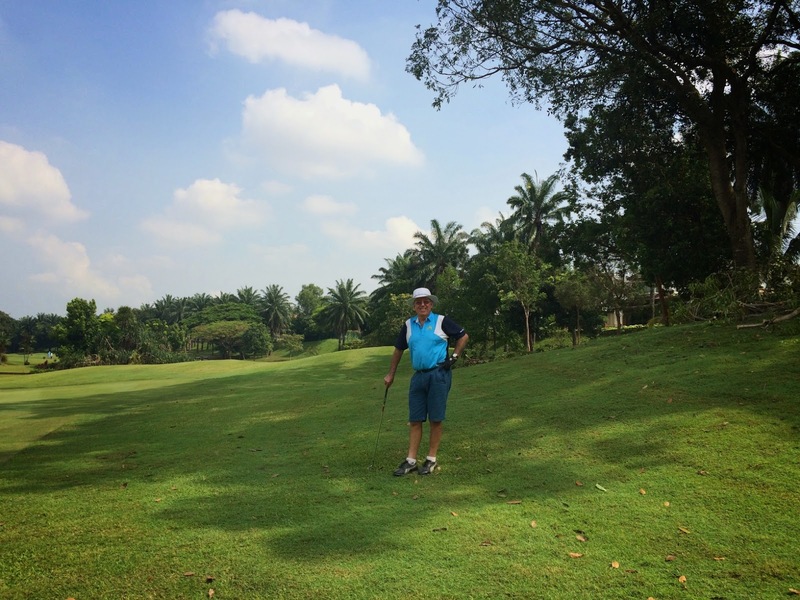 They had an excellent CNY golf offer on so it was good value for this quality of course. 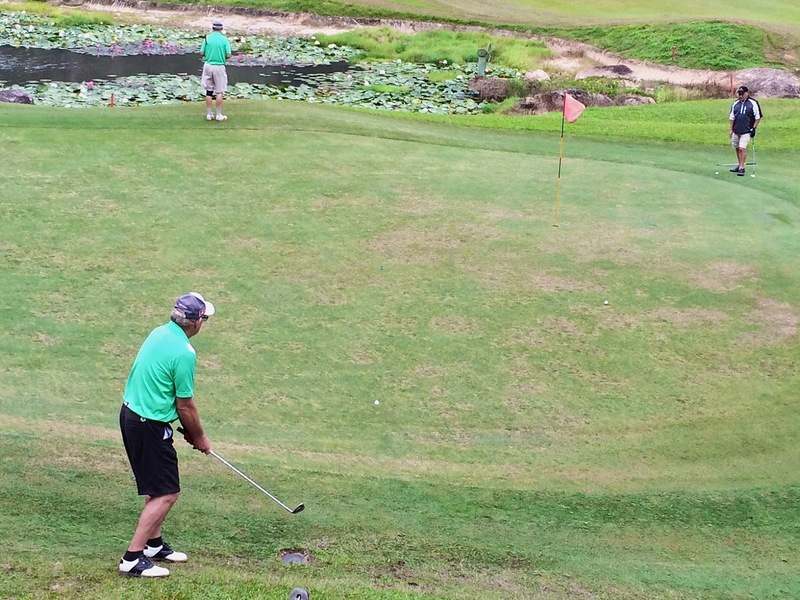 We all got off at just before 8:00am and most were finished shortly after 12:30pm. 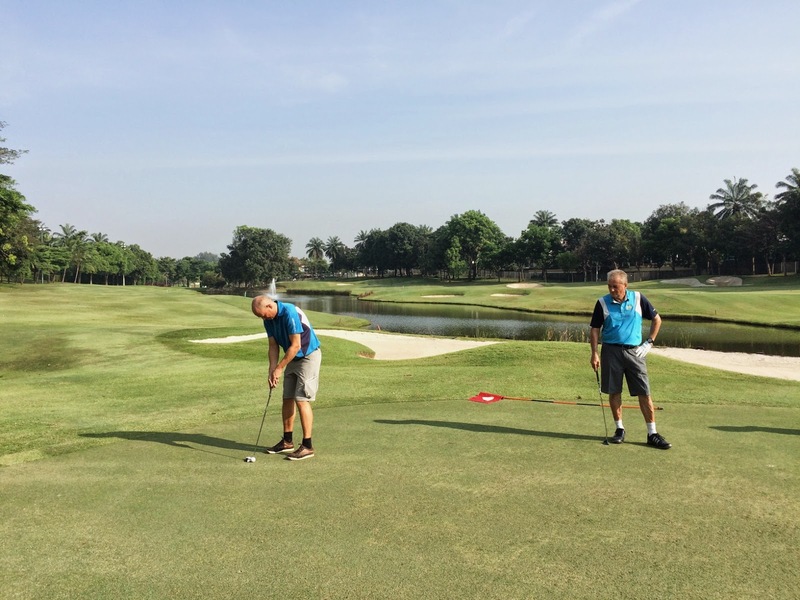 Conditions were excellent – the weather clear and sunny and the course condition as always excellent, particularly the greens. 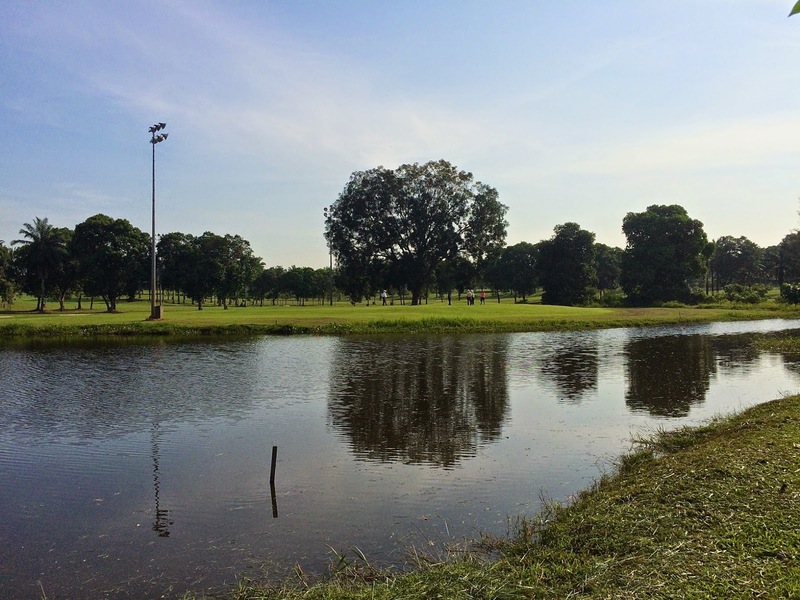 After the game we lunched at the nearby O&S Seafood Restaurant in Kota Kemuning. 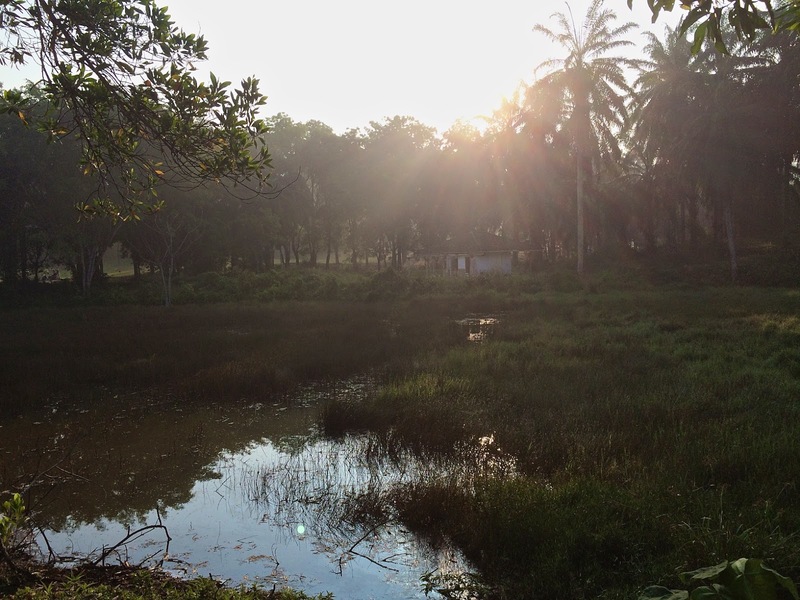 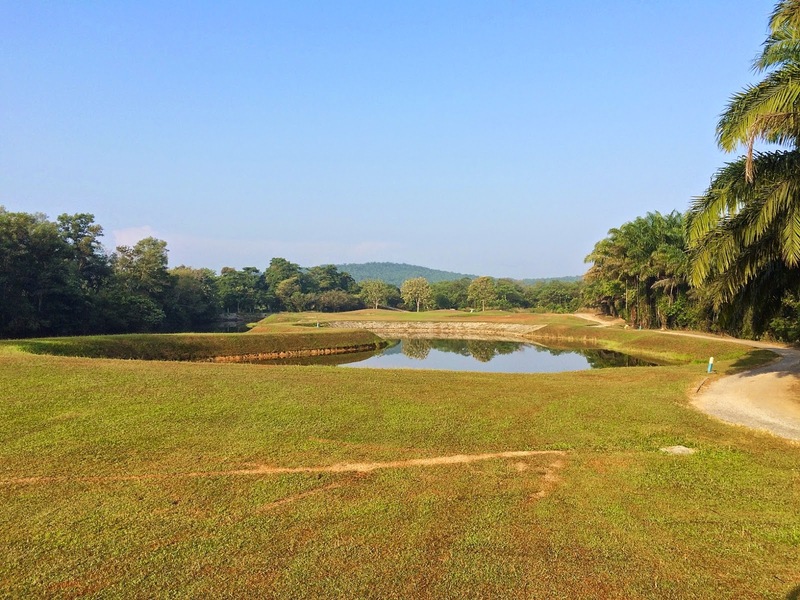 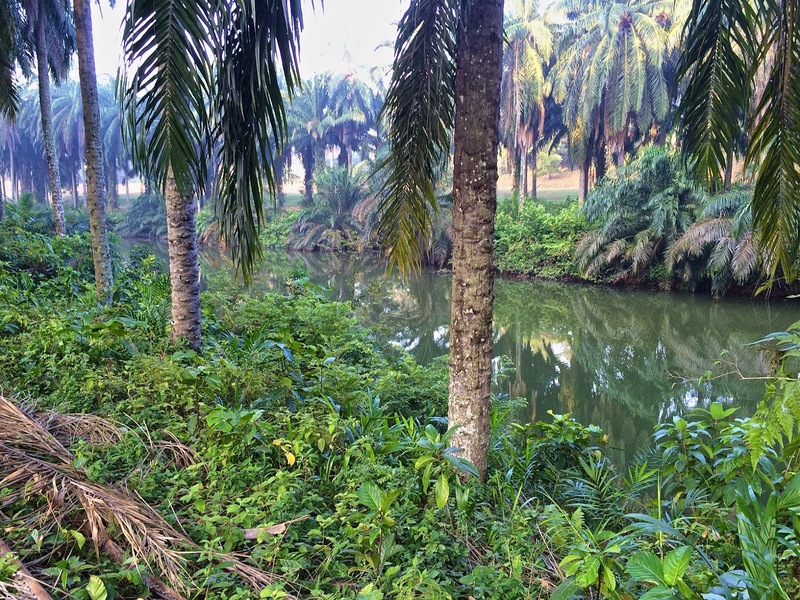 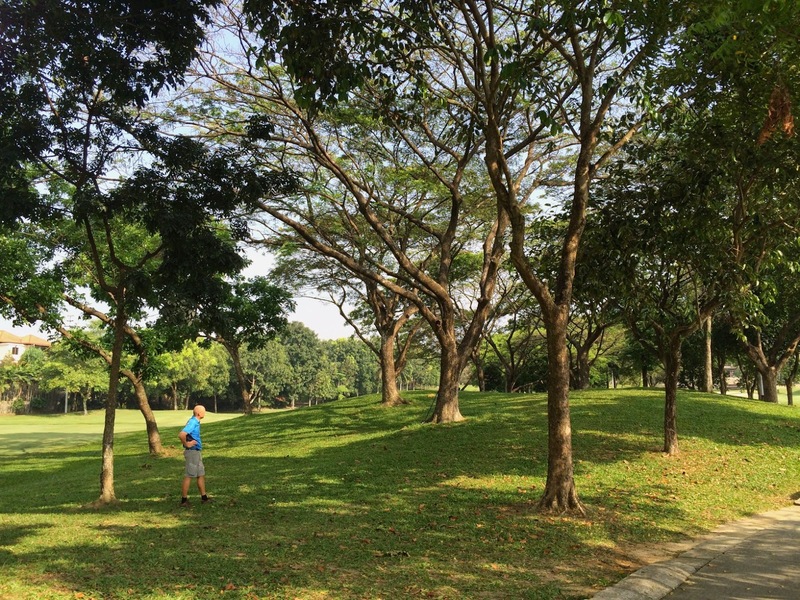 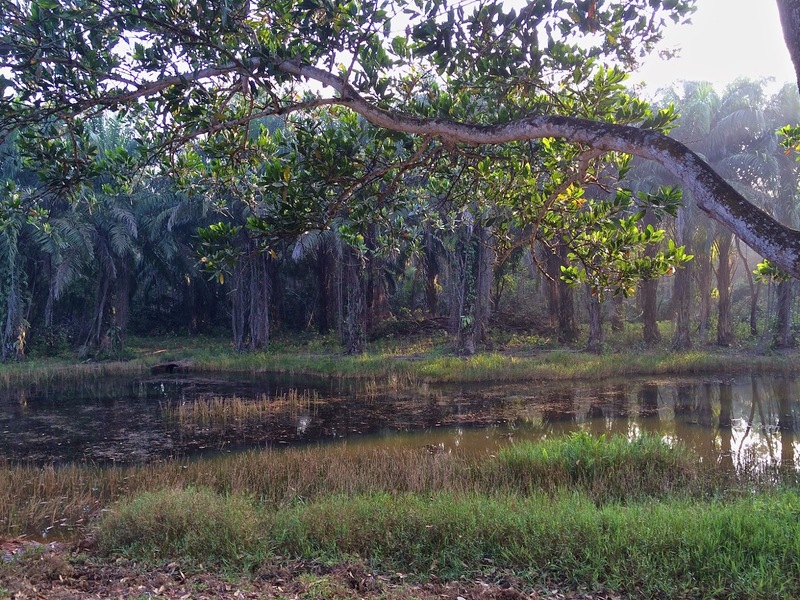 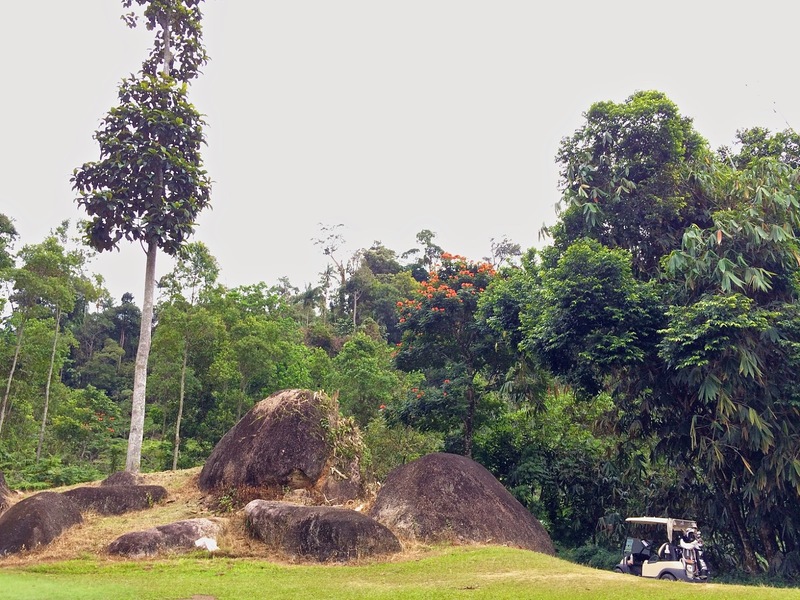 This week we decided to head north to Bukit Beruntung which we had not played for many years. 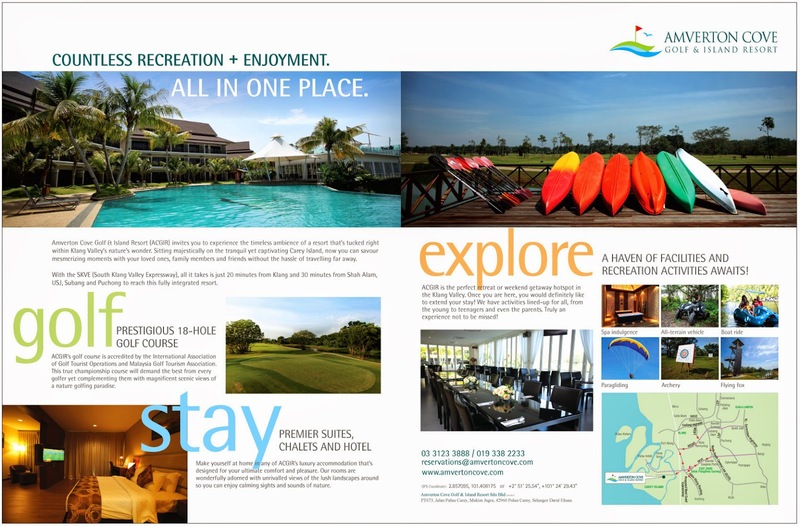 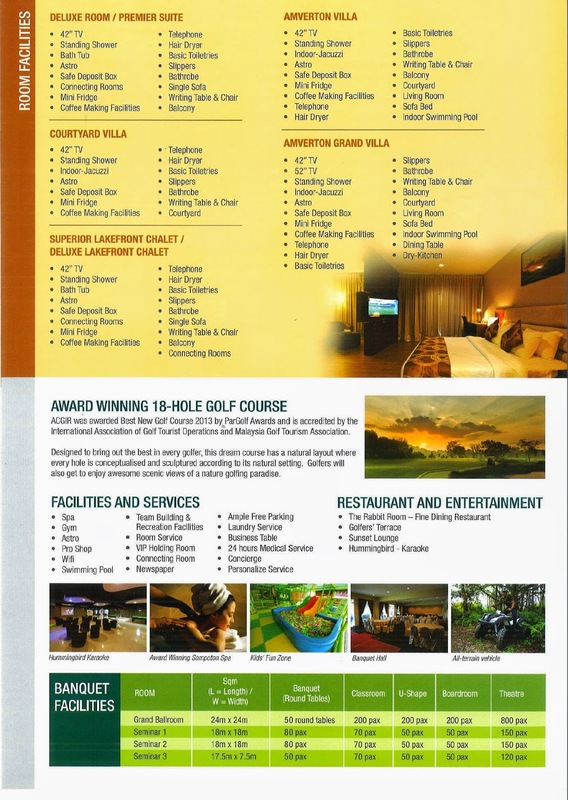 It was listed in the Top Premier book at a bargain rate of RM50 but when calling to book I was informed there was a special rate of RM45. 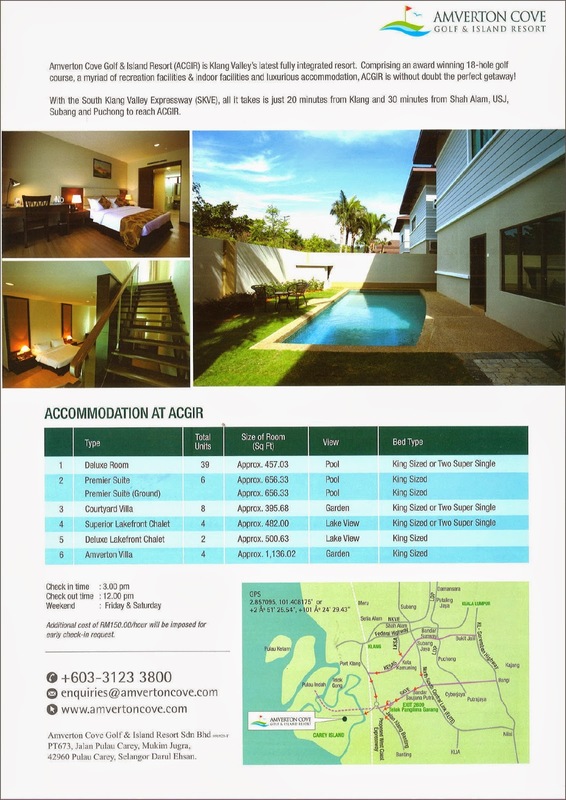 Later we found that this did not include insurance which we had to pay separately but still a very economically attractive rate. 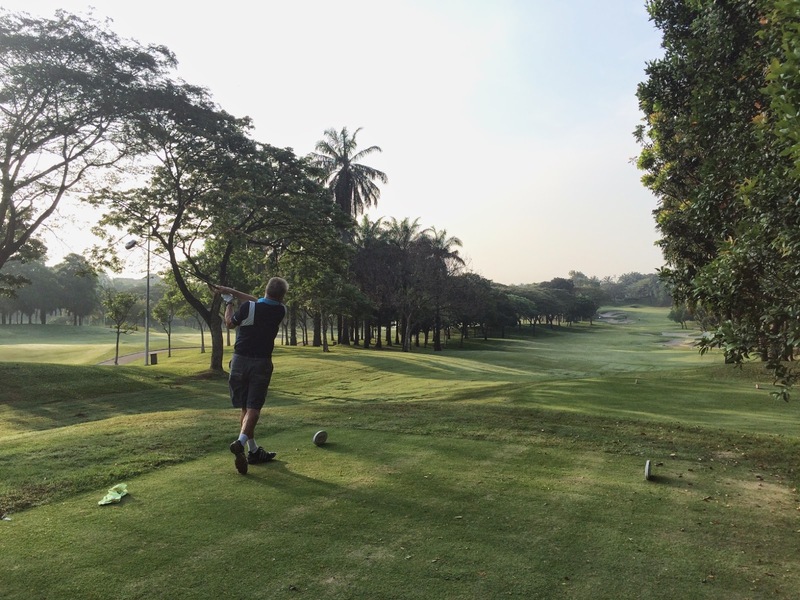 The club has 2 18 hole courses – we played the better?? 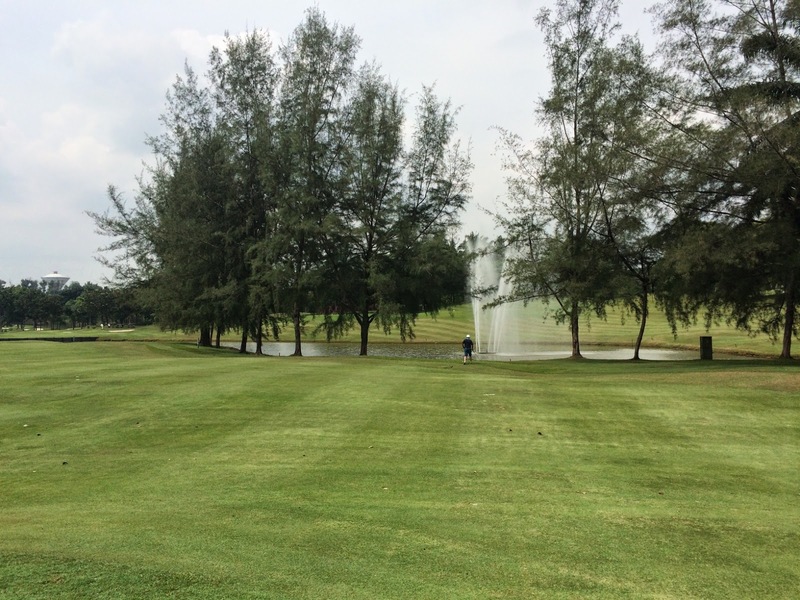 East Course and with the Saujana group which had taken over this club some years back we perhaps naively thought it may have improved. 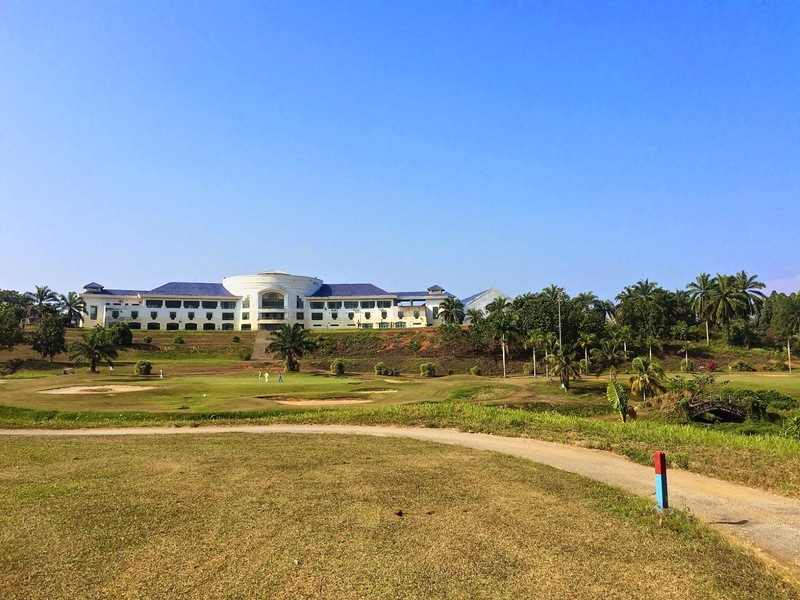 The clubhouse is a very large and ominous looking building which is now in a bad state of disrepair. 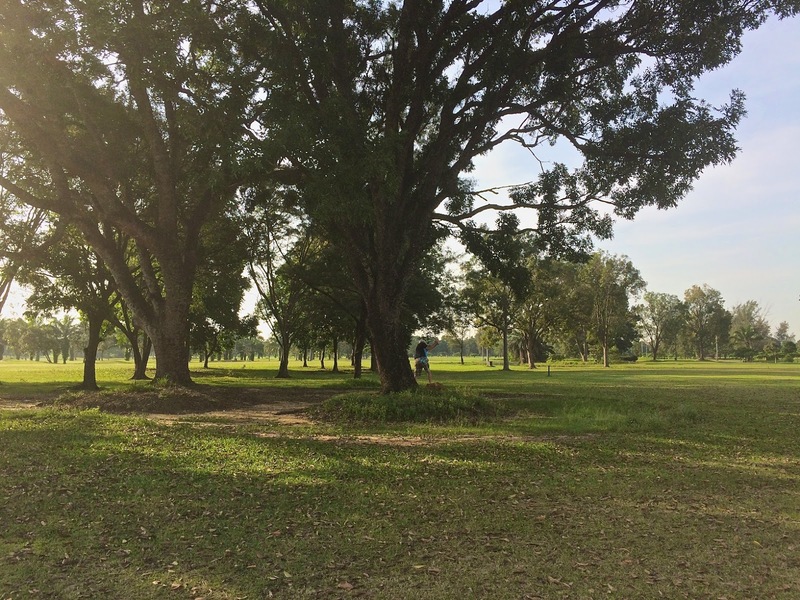 An outhouse which stored all the grass cutting equipment had recently been in a major fire and was completely burnt out …. 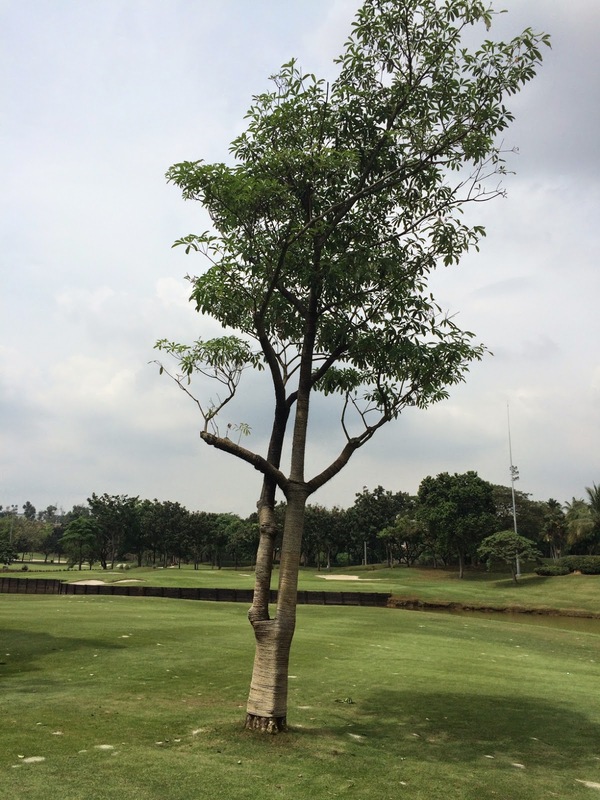 insurance job?? 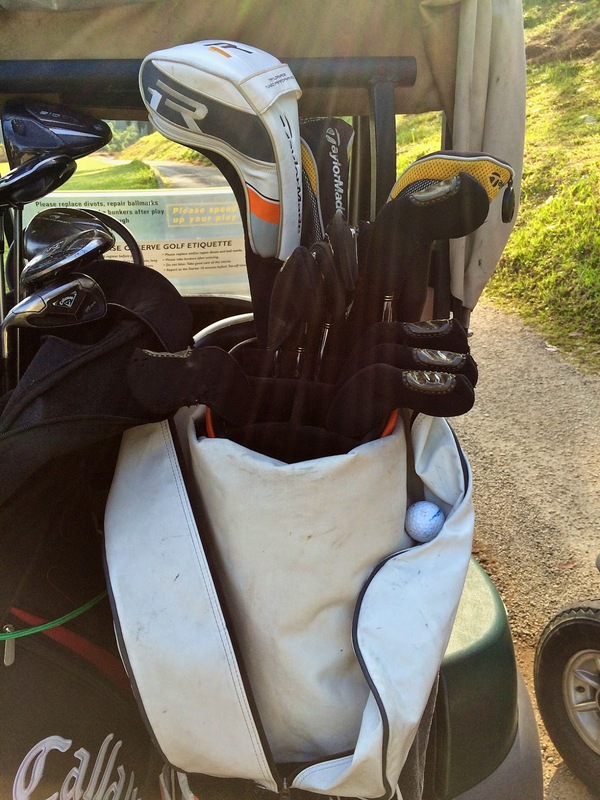 There were 13 of us …. 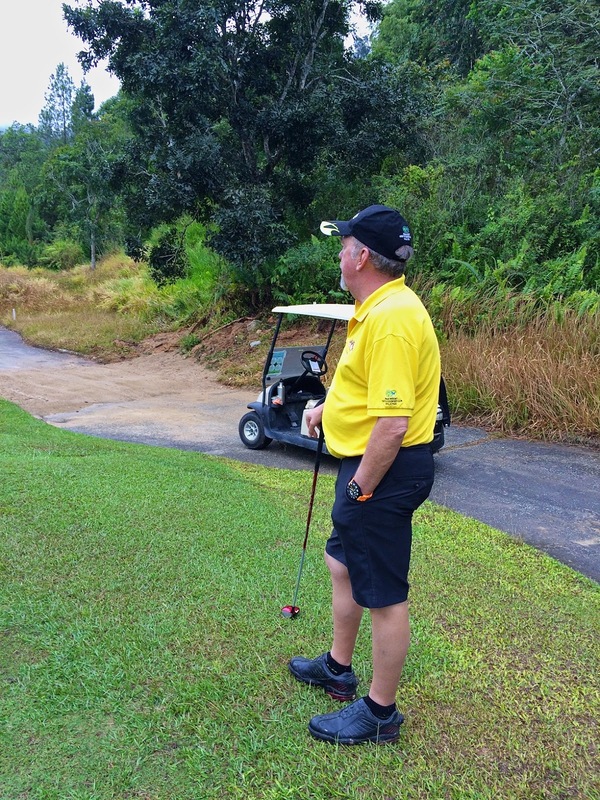 again sadly let down by last minute pull outs which created extra costs for a number of 1/2 buggy charges. 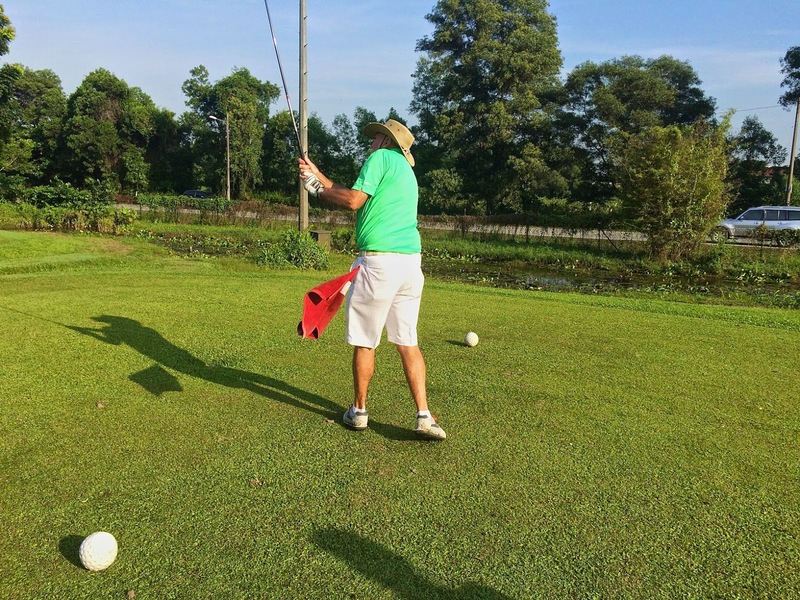 We all got off on 2 separate tee boxes at just before 8:00am and the first 9 holes were relatively cool, but got progressively hotter as the morning went on. 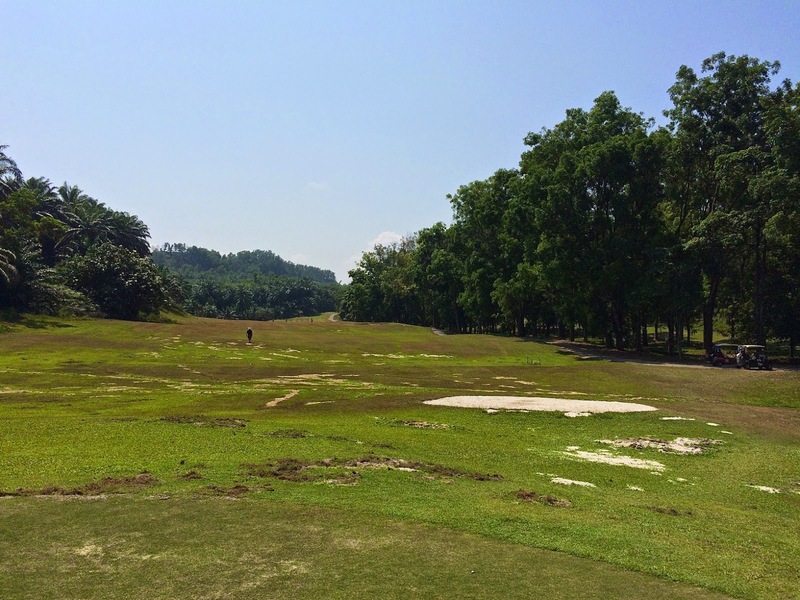 The course was badly cut up by wild boars and the green surrounds were in pretty bad shape as were the bunkers. 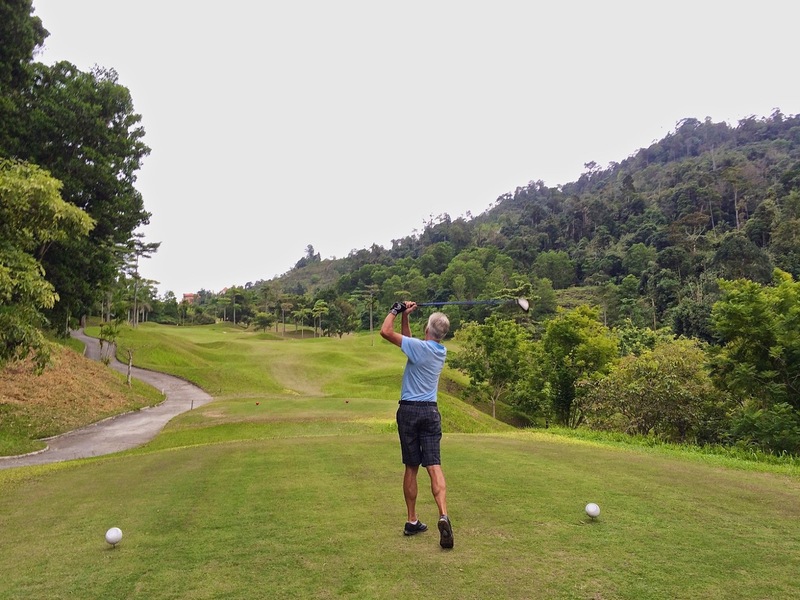 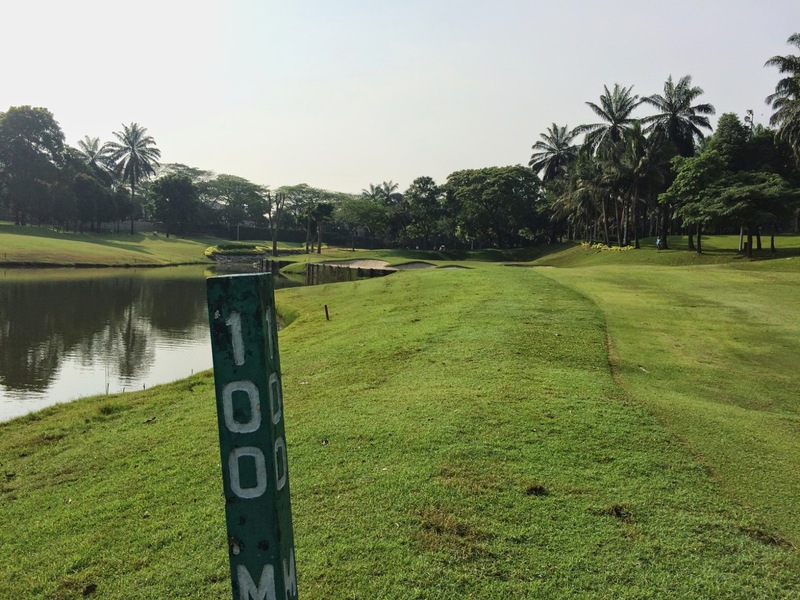 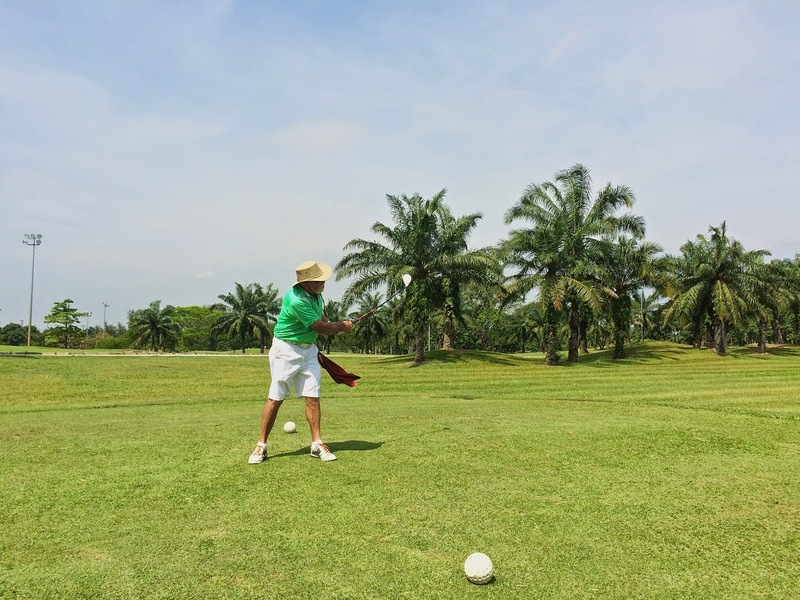 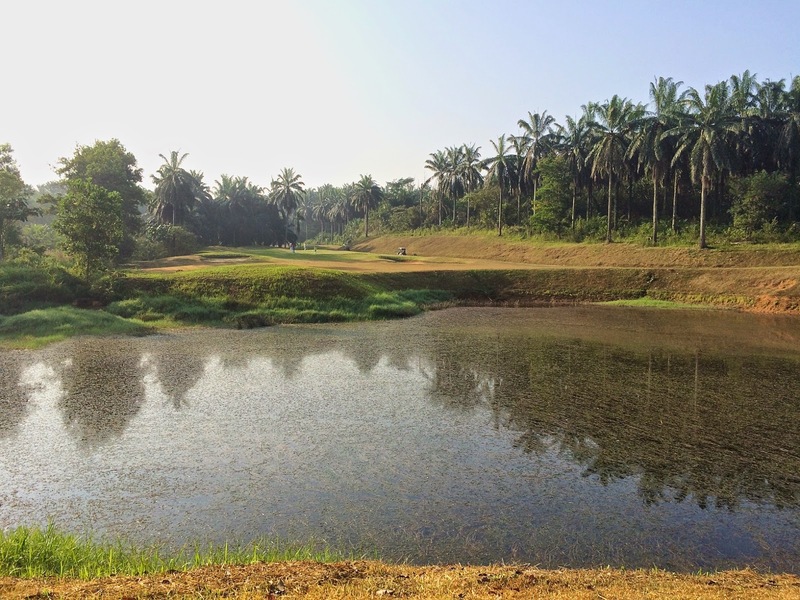 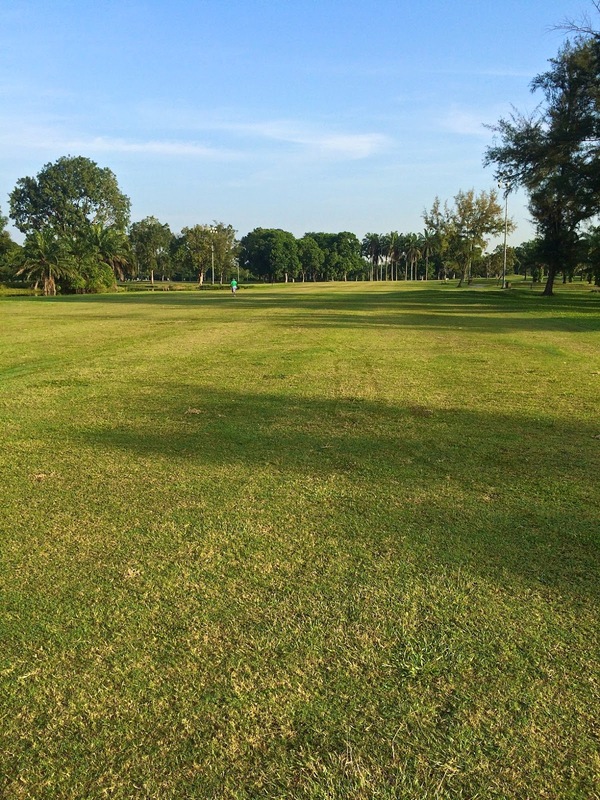 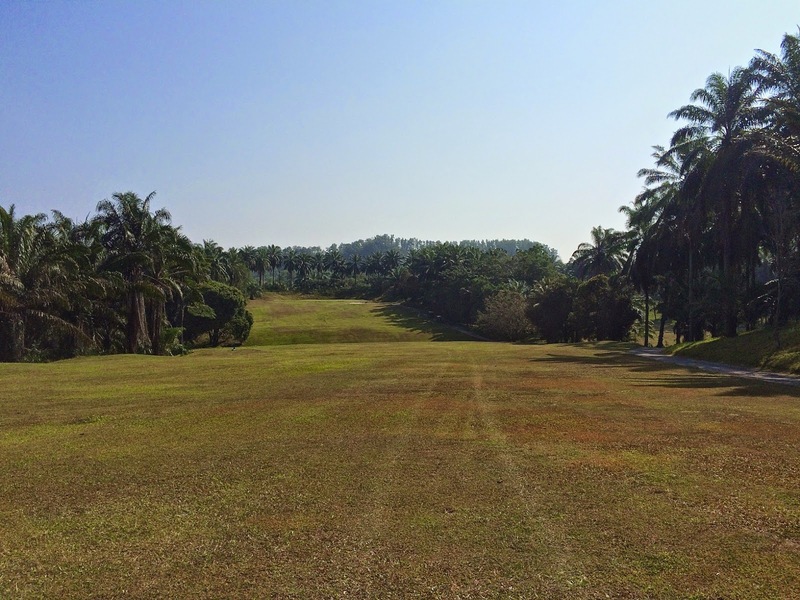 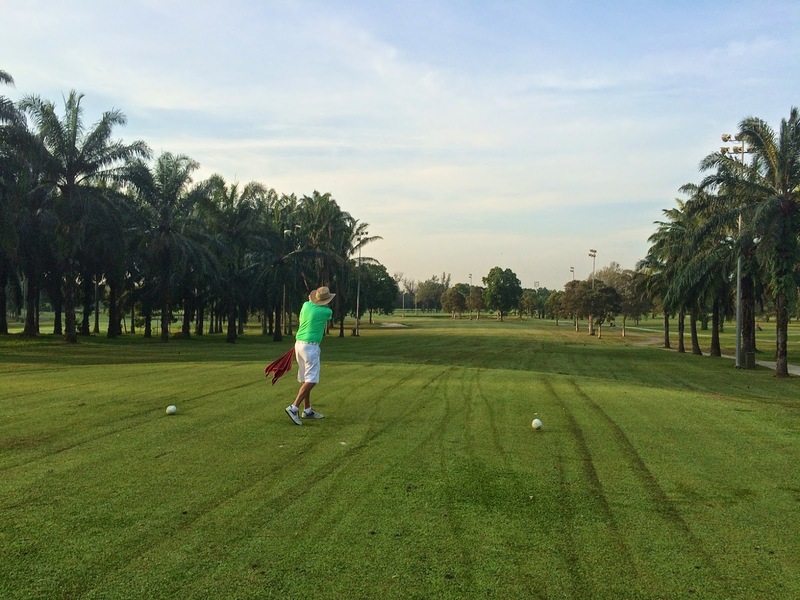 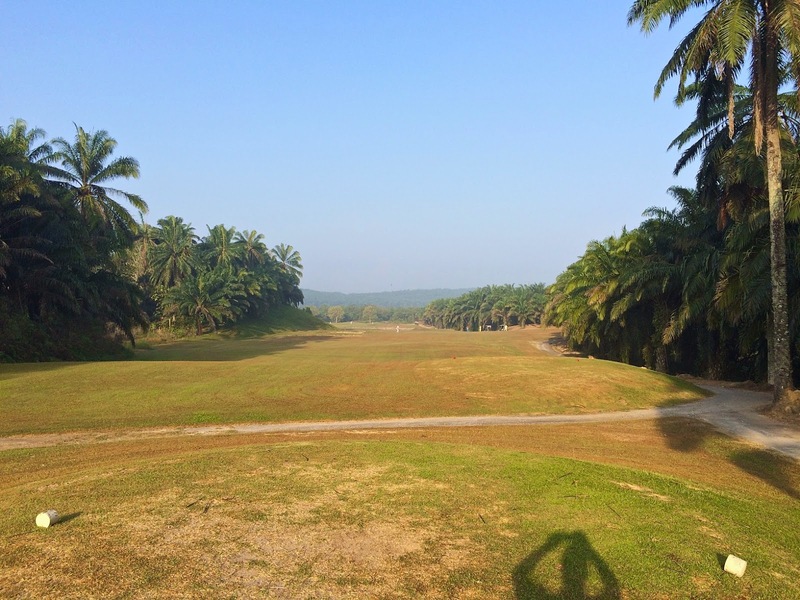 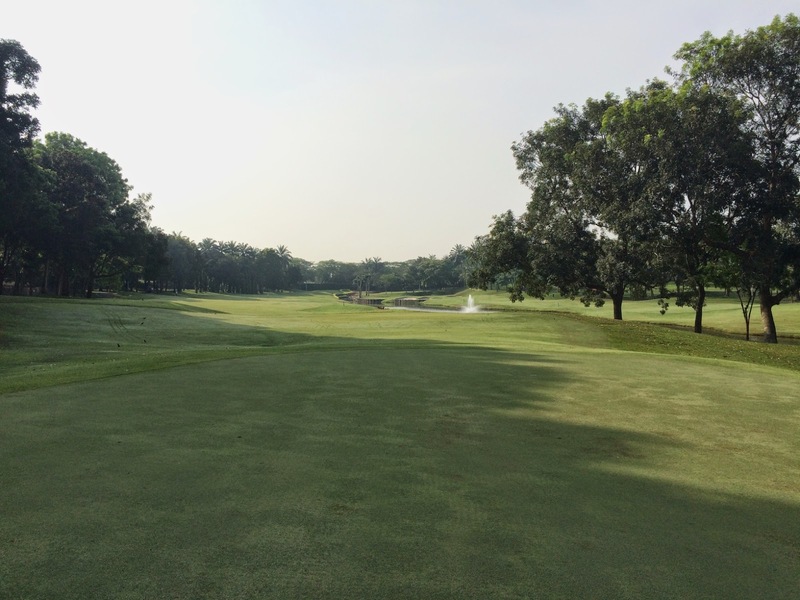 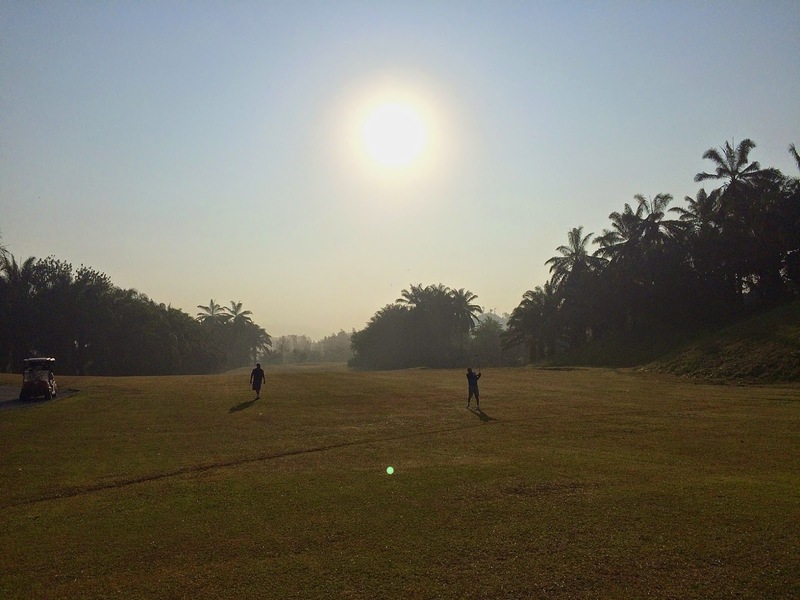 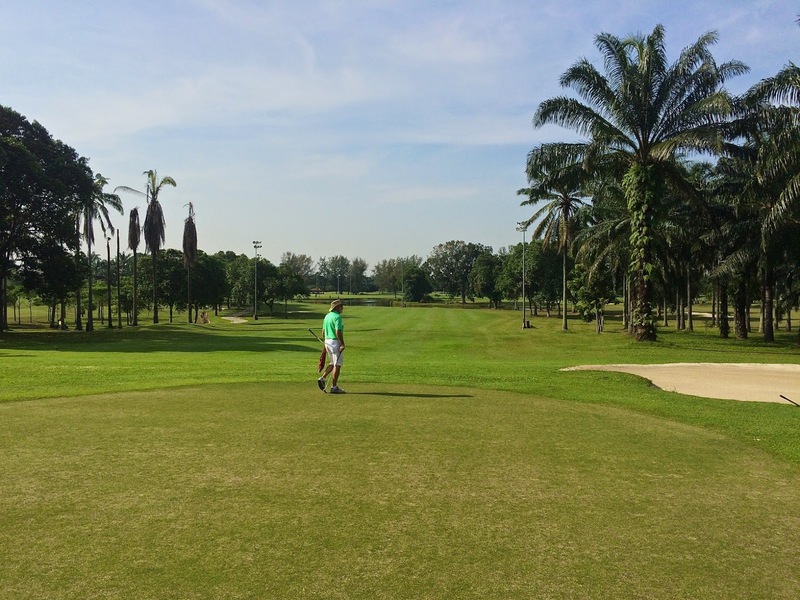 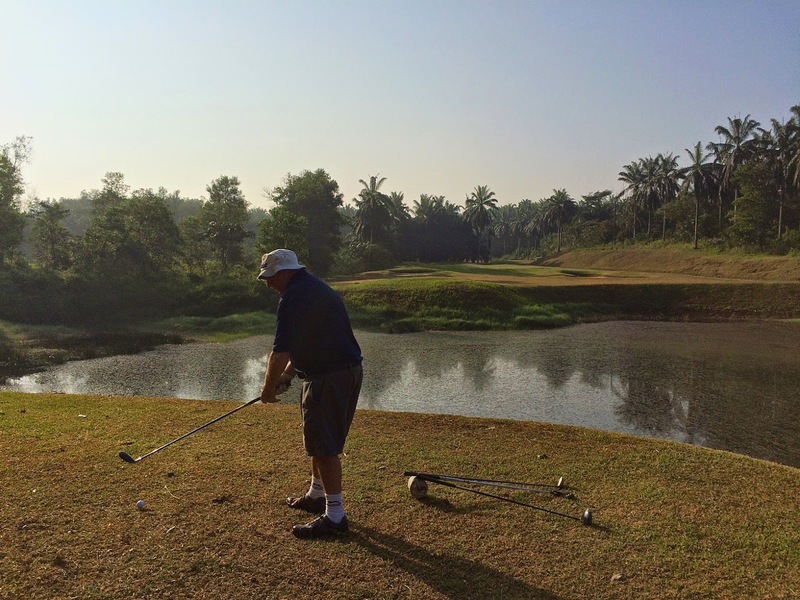 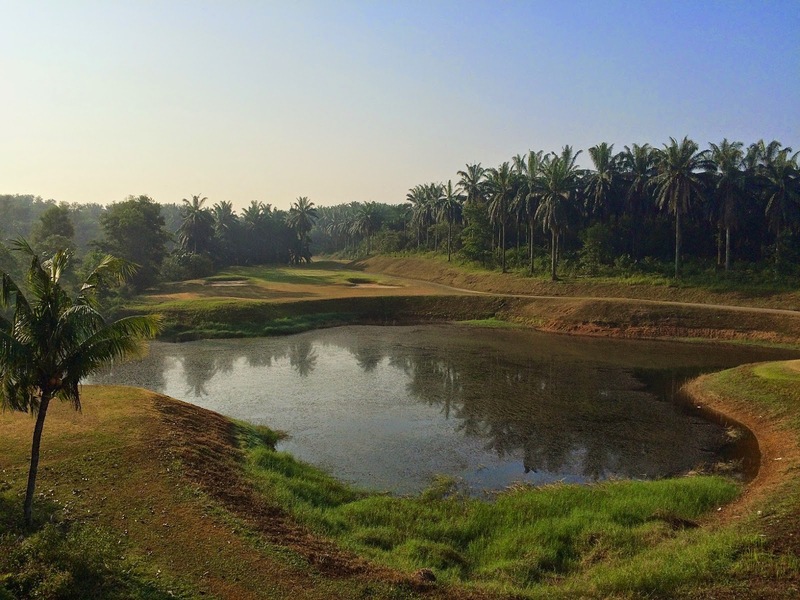 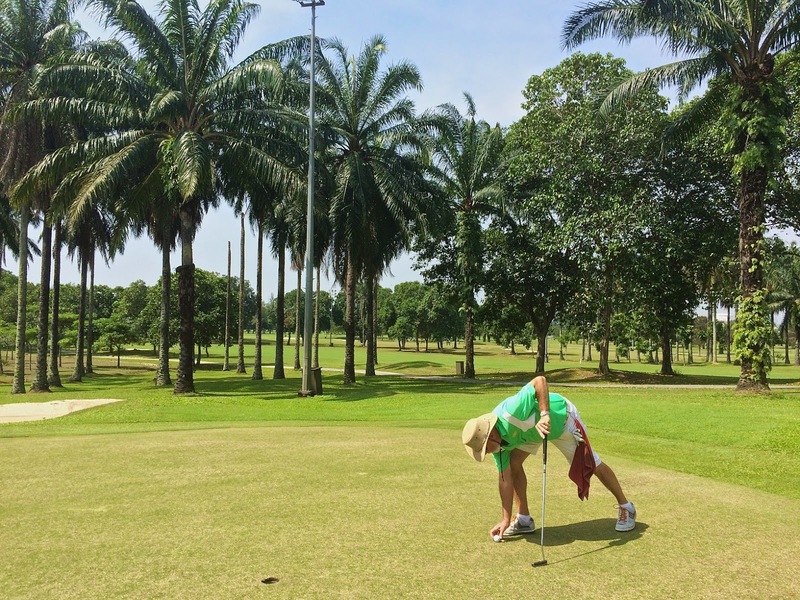 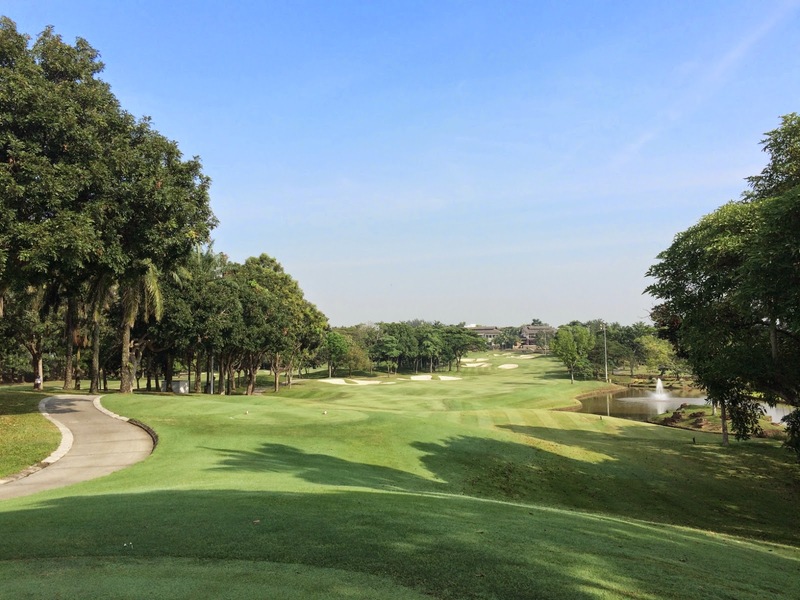 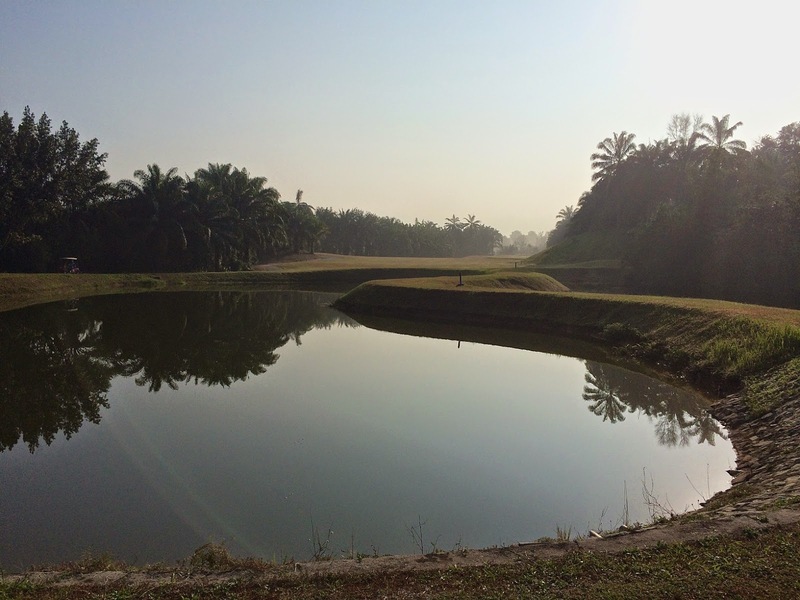 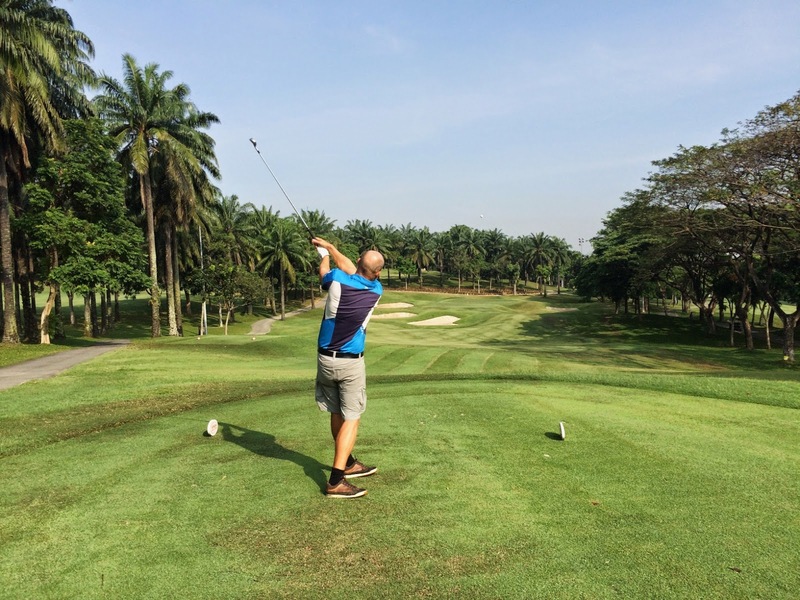 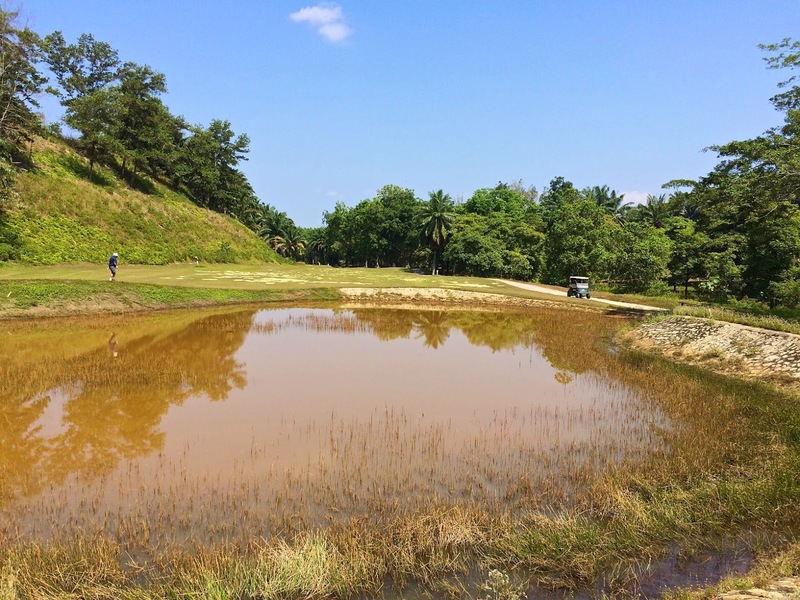 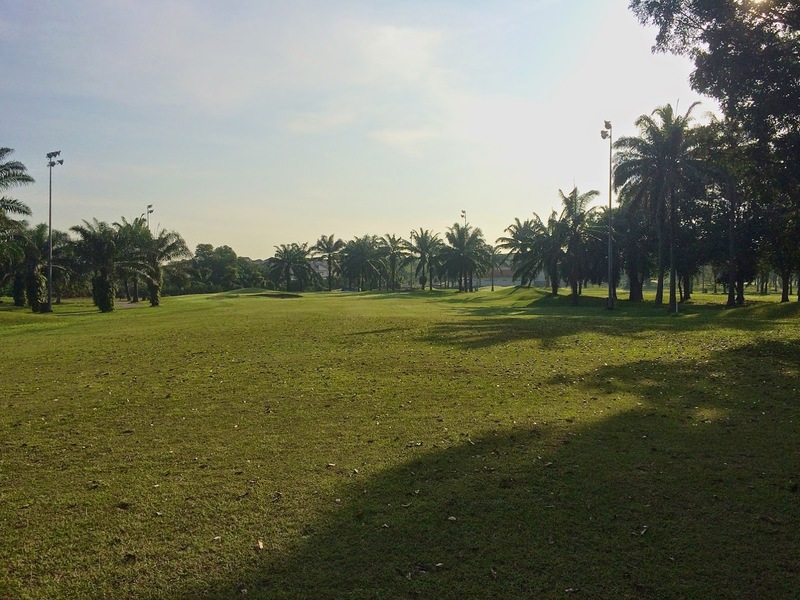 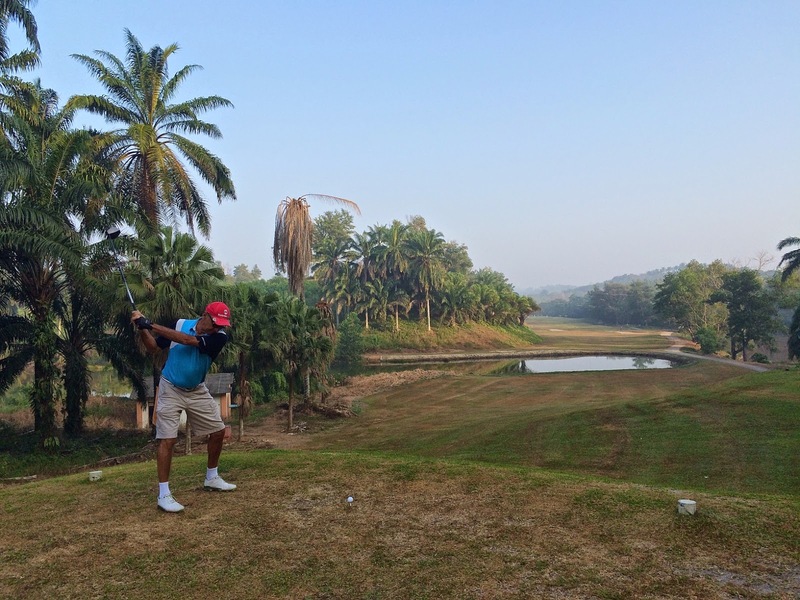 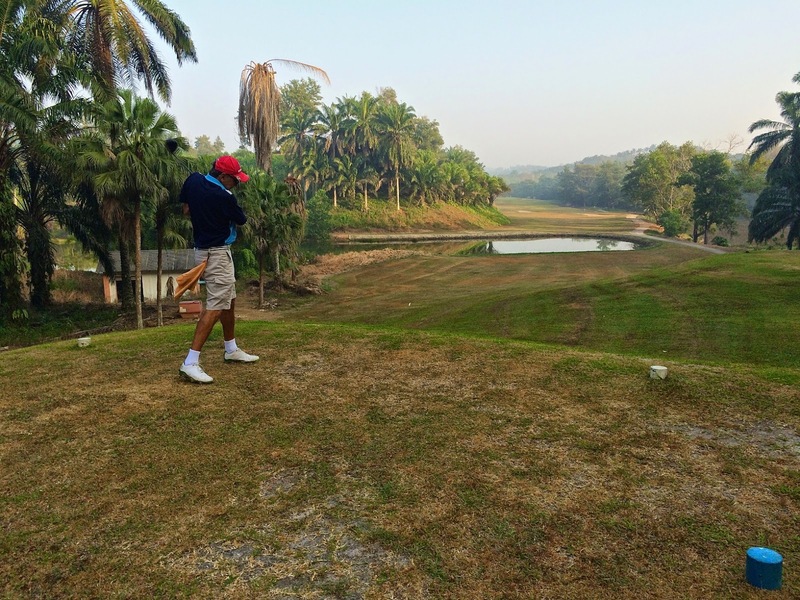 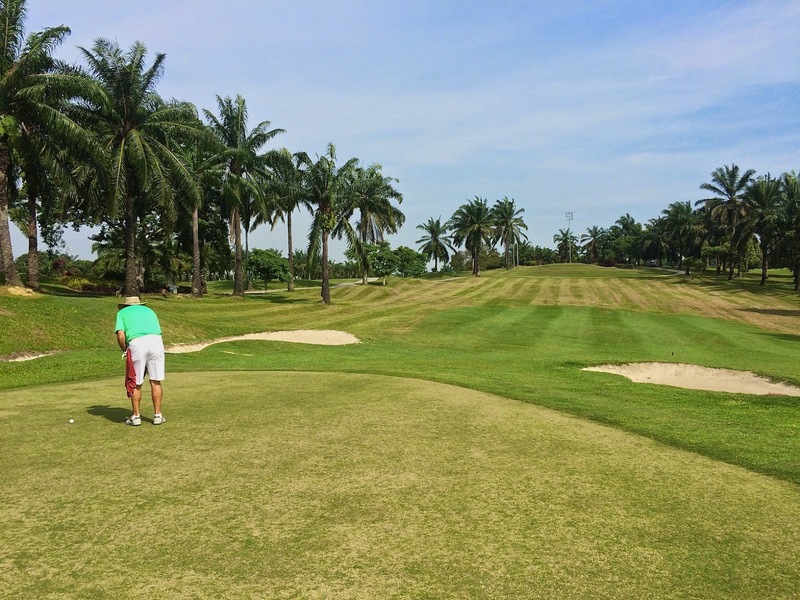 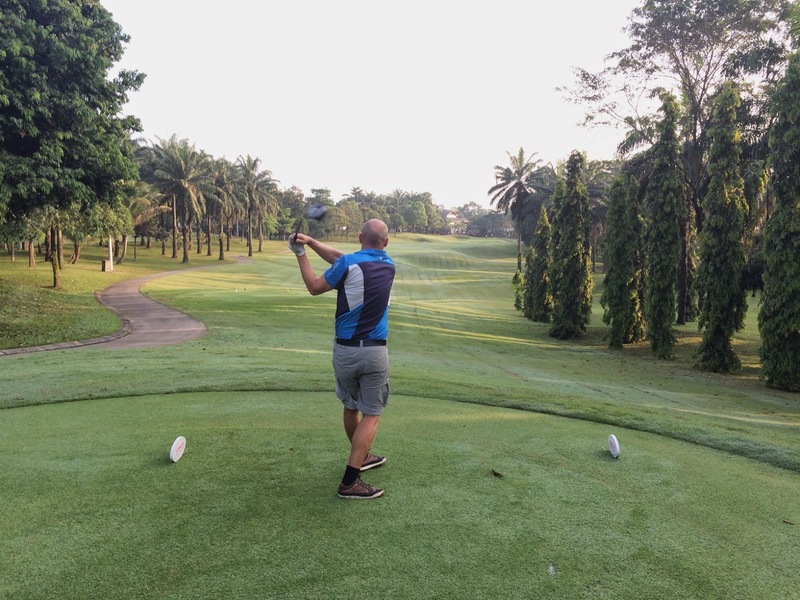 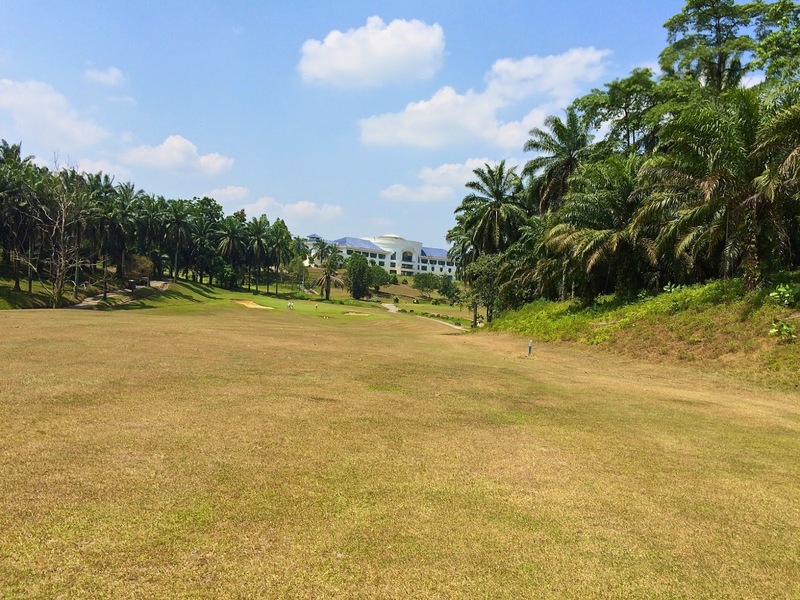 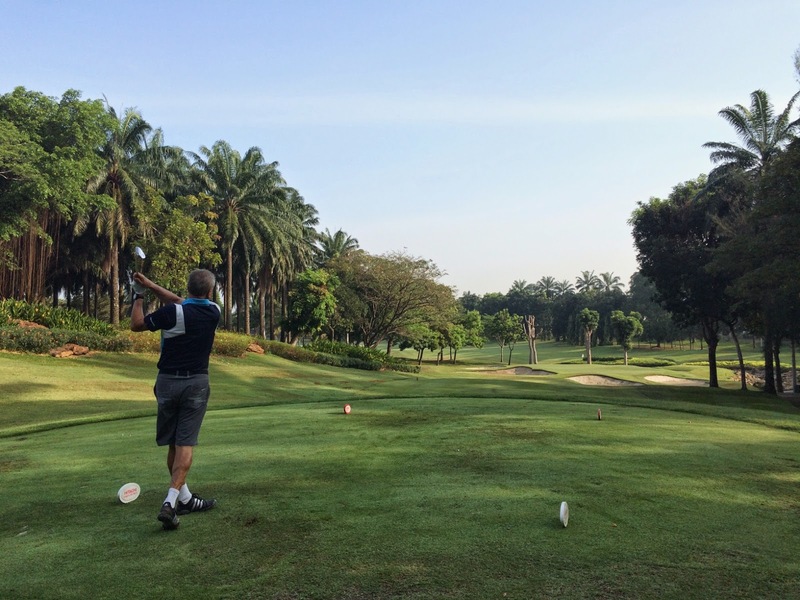 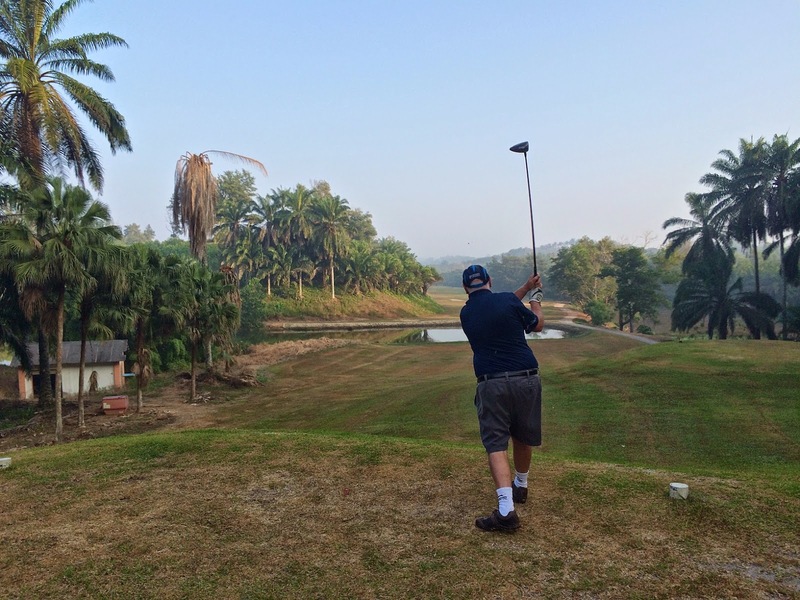 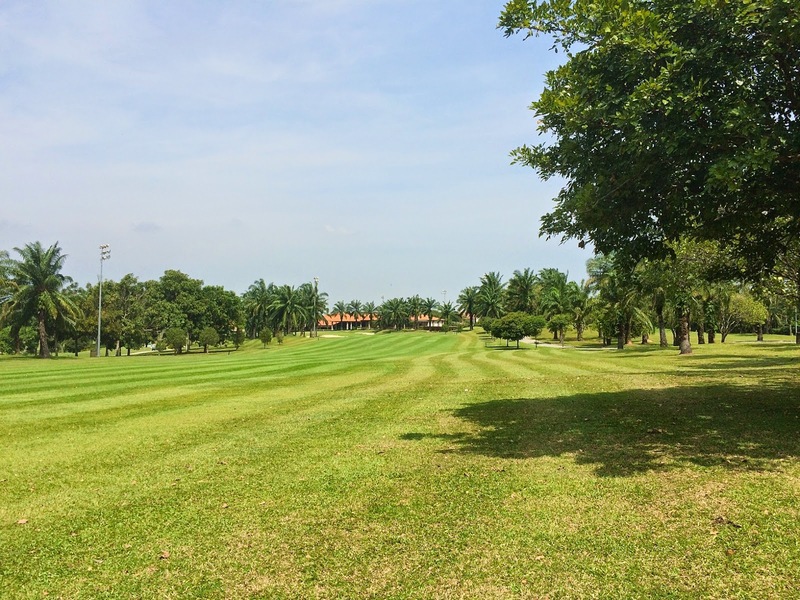 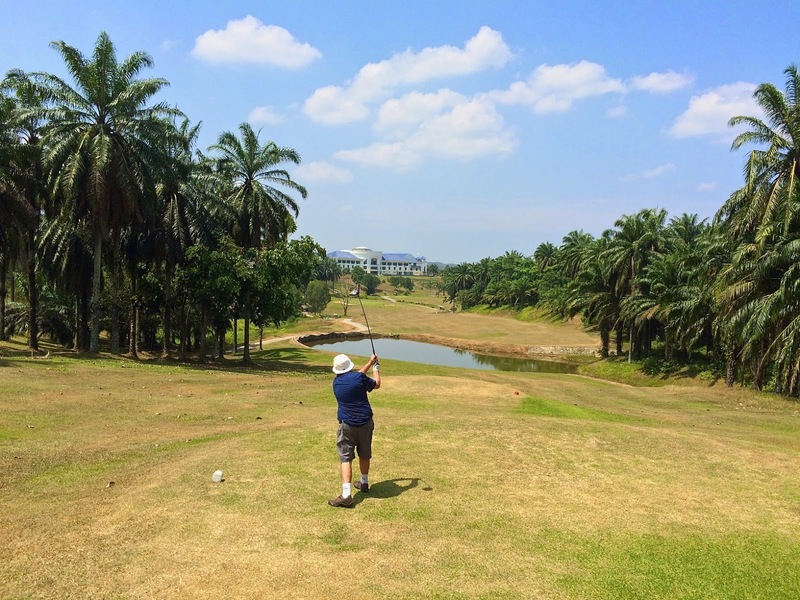 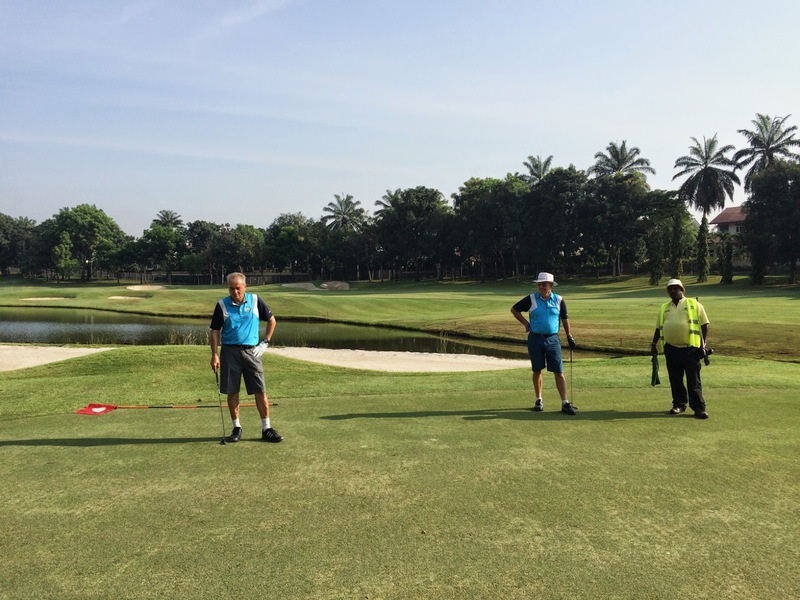 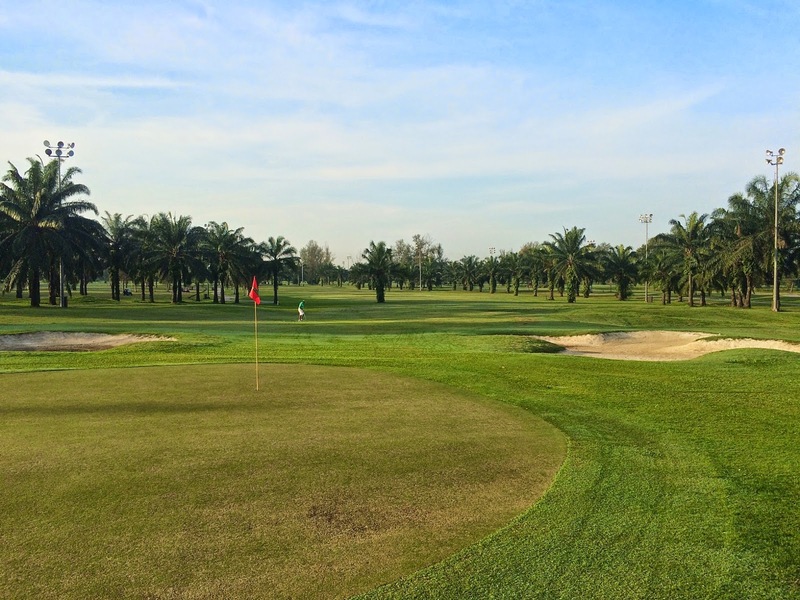 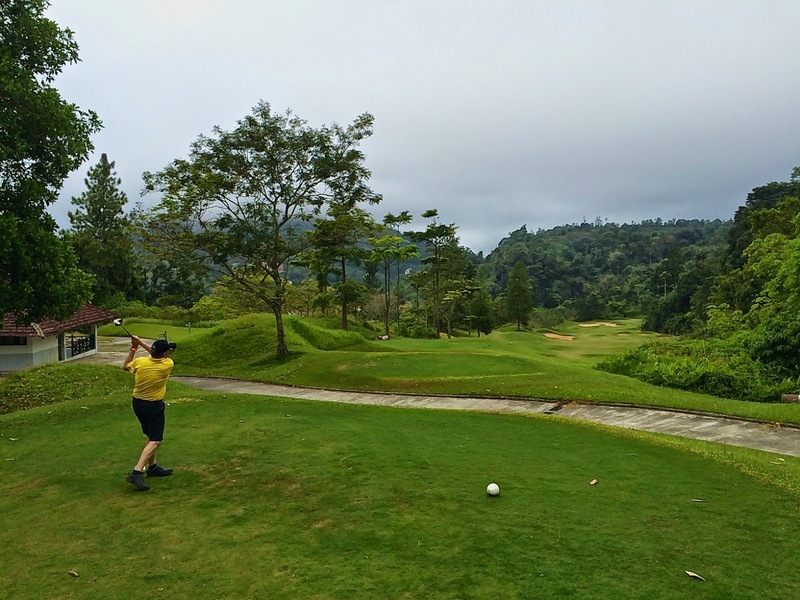 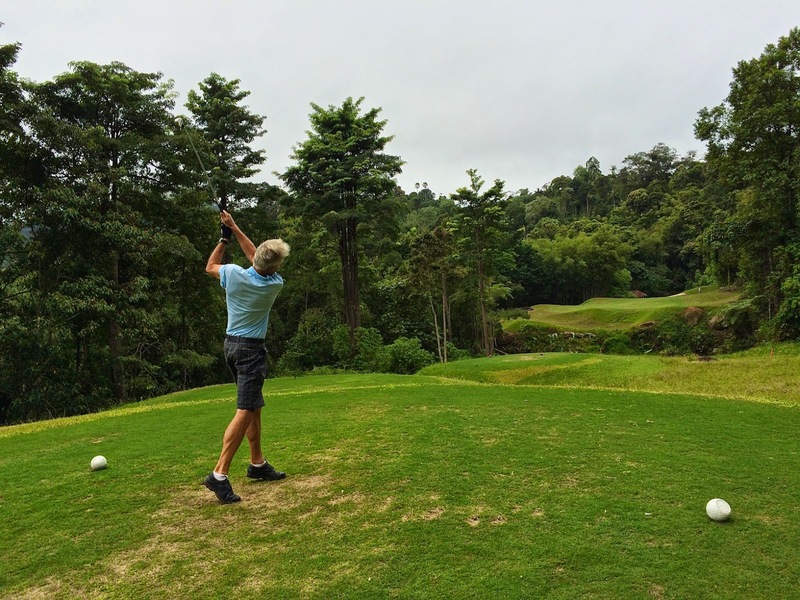 You really had to keep on the fairway as there was no relief by slicing or drawing onto other fairways – each hole was individually carved through the palm oil plantations so once of the fairway your ball was well and truly gone. 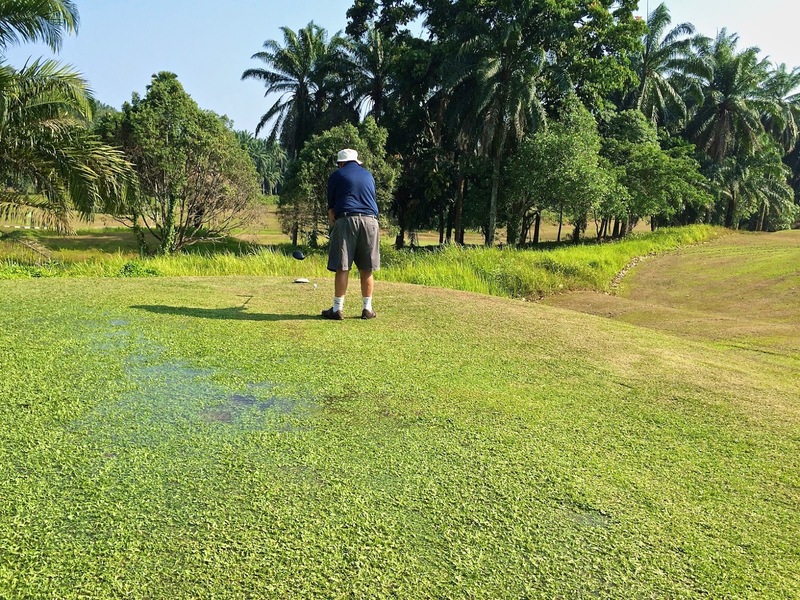 The greens were very soft and spongy with many bumps and fairly slow – particularly one green which had been left to grow and resembled the texture and nature of my ex-mother-in-law’s thick shag pile Axminster carpet. 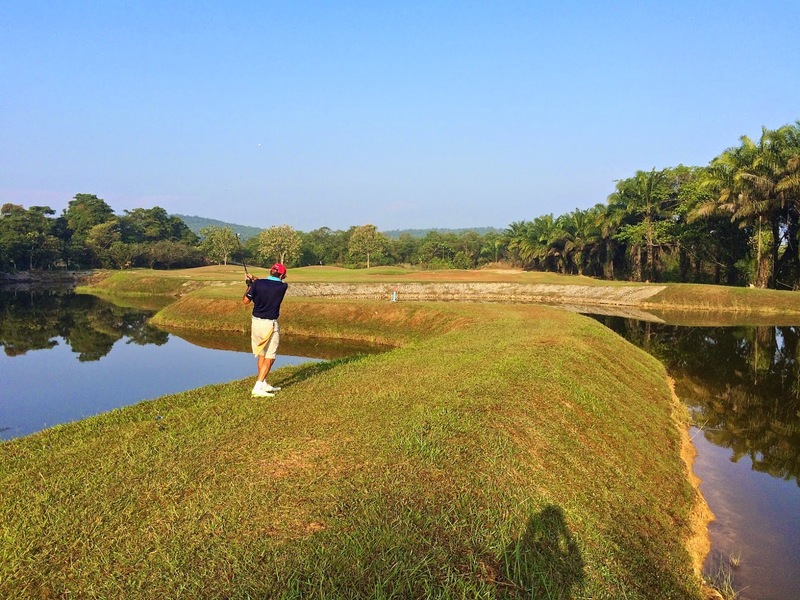 However the course was extremely scenic and had some interesting holes as can be seen in the photos below. 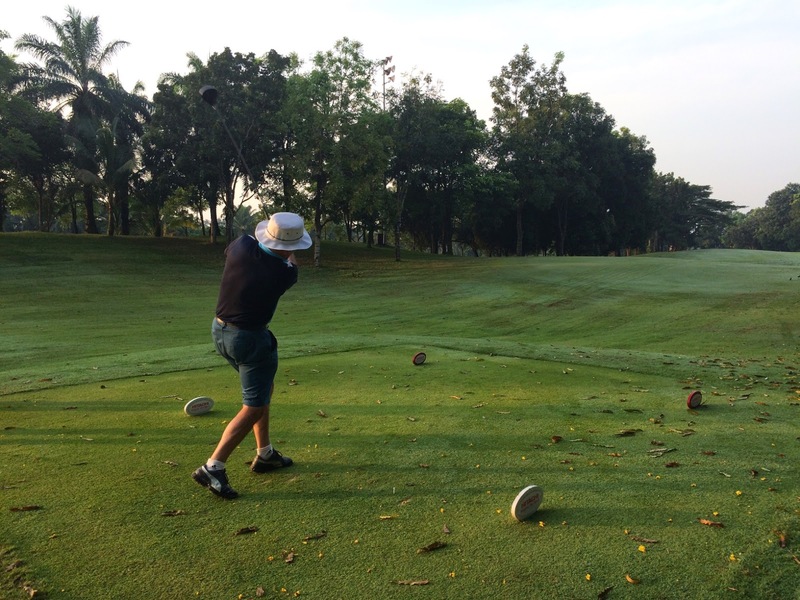 Barry cousins was celebrating his 300th game today – well done Barry – and he kindly sponsored the drinks. 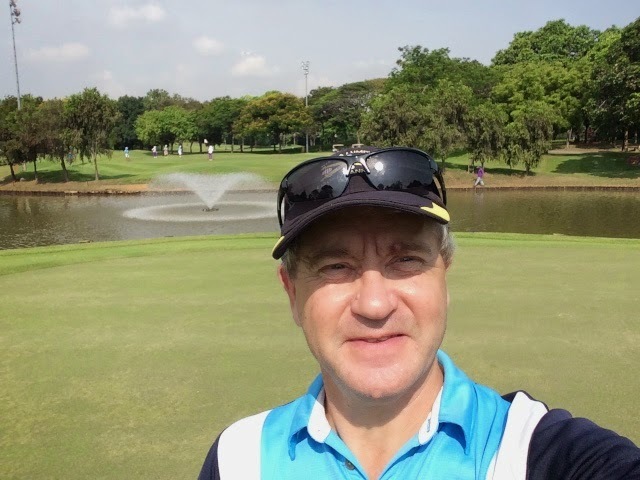 Allan McNicoll was having his last Loose Cannons game prior to heading to South Africa so he kindly bought lunch for everyone. 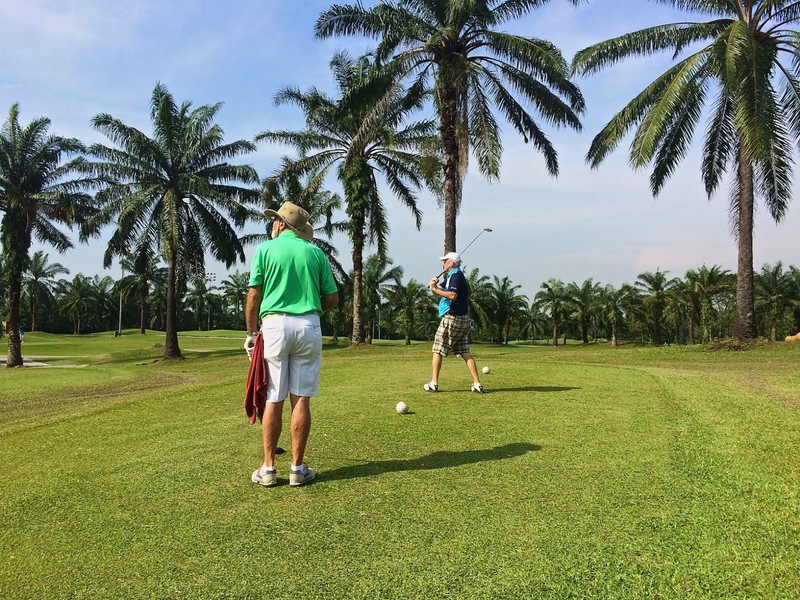 Thanks Allan and Barry! 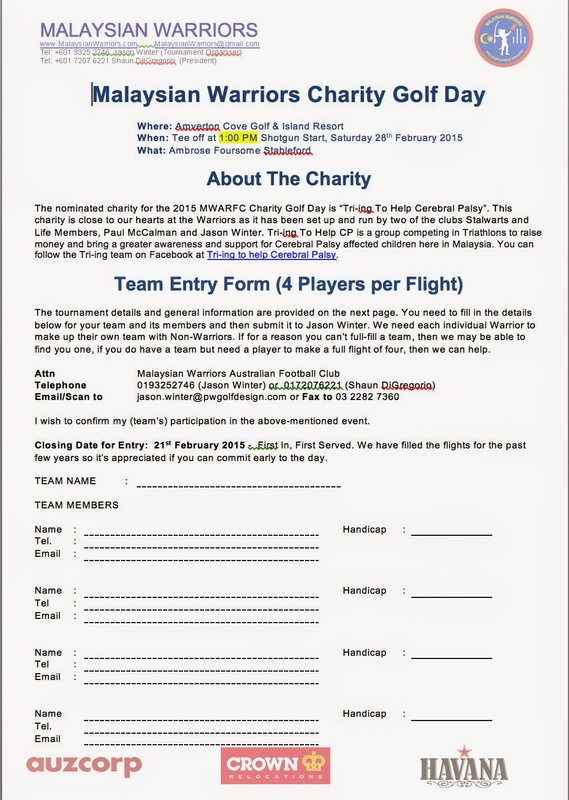 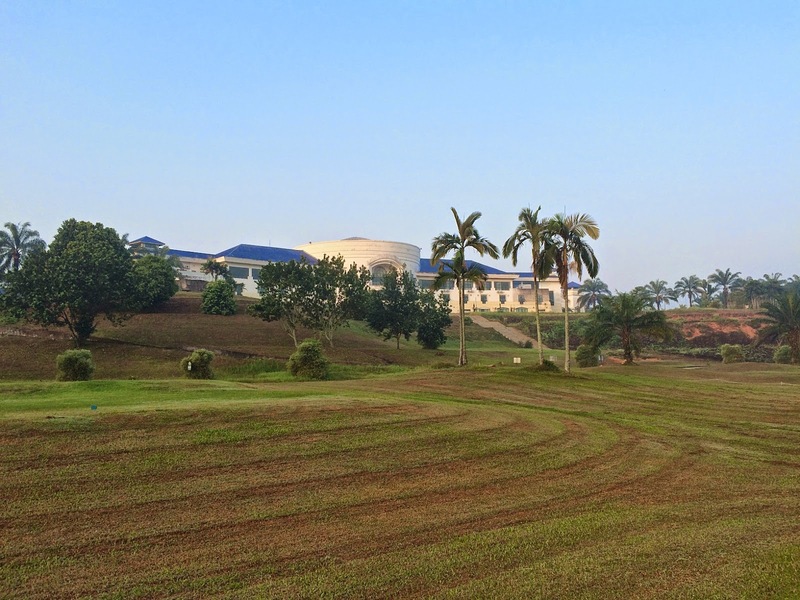 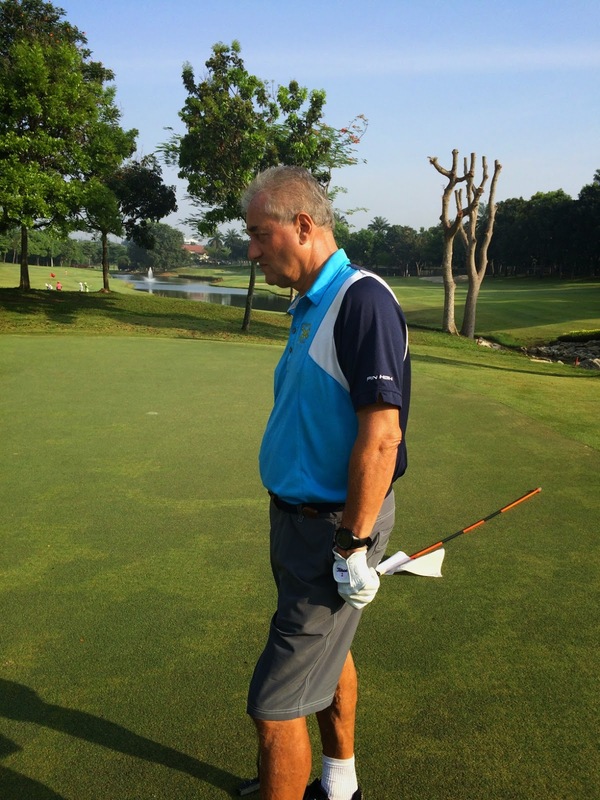 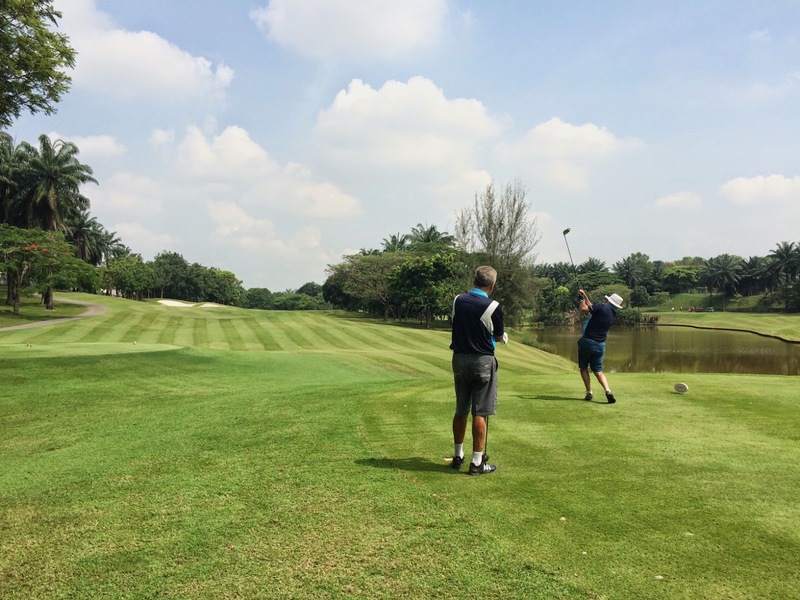 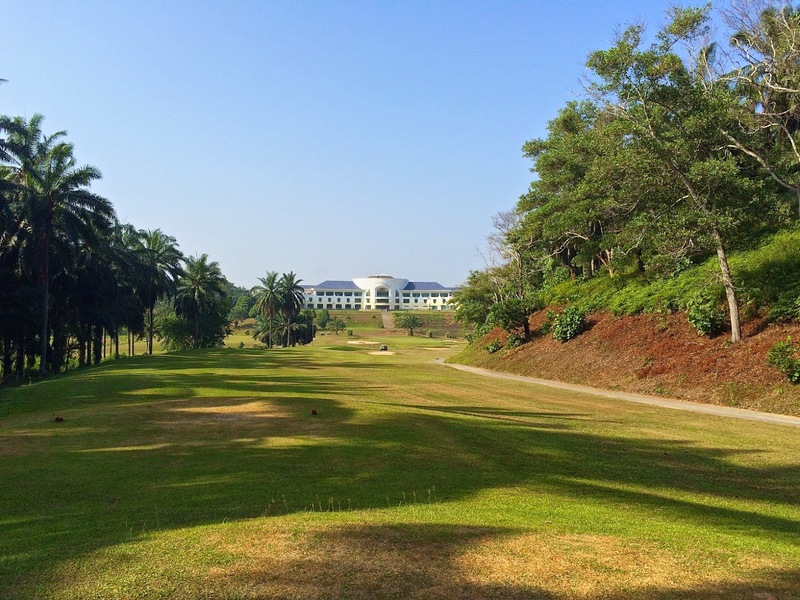 The Malaysian Warriors are holding a Charity Golf Day again soon on the 28th February 2015. 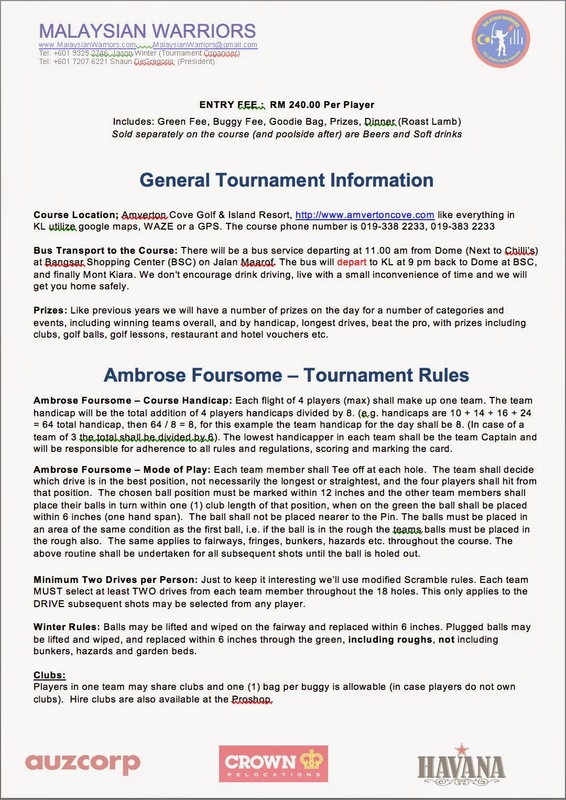 The last event was a great success so anyone interested to attend please see the entry form here. 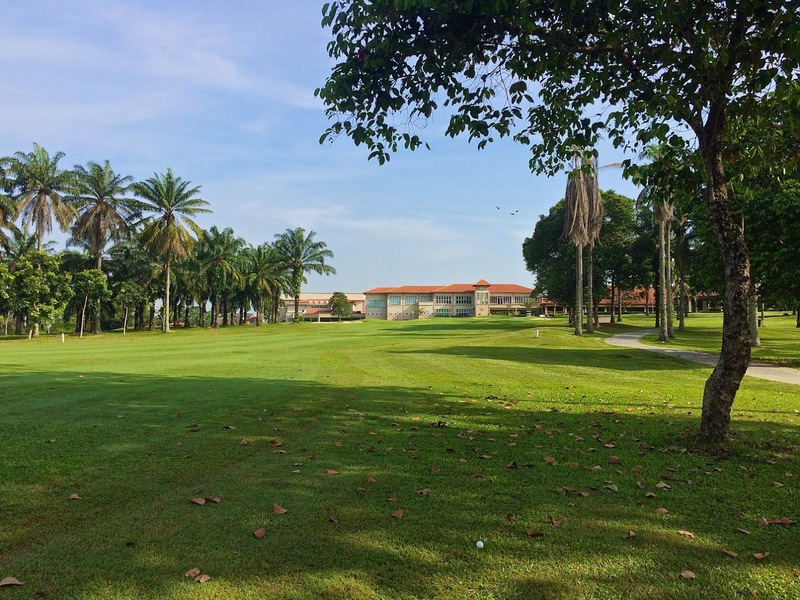 It will be a Scramble format and will be held at Amverton Cove Golf Resort. 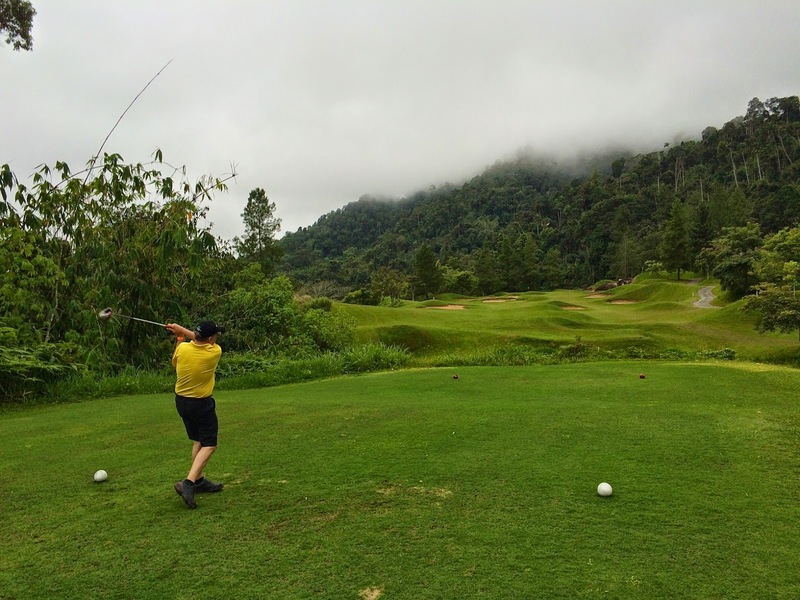 This year we are raising money in aid of cerebral palsy affected children here in Malaysia. 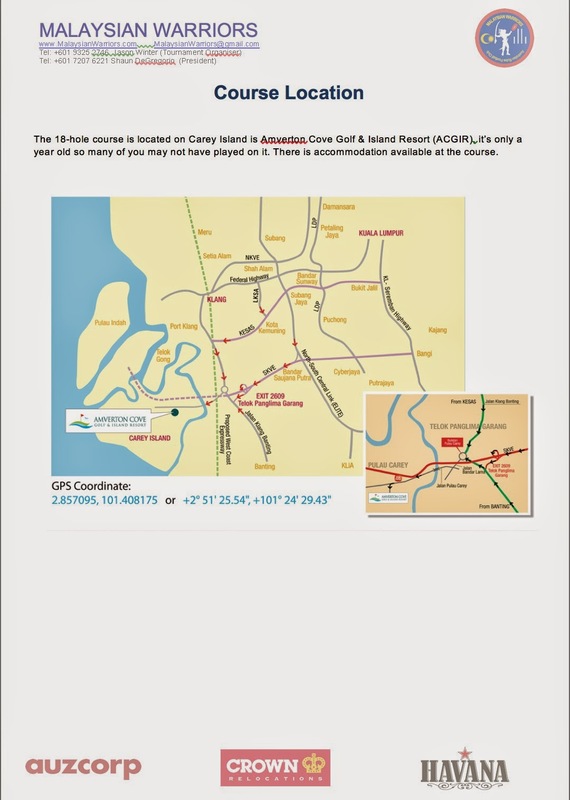 For players wishing to stay over in Carey Island there are also some details of the hotel here. 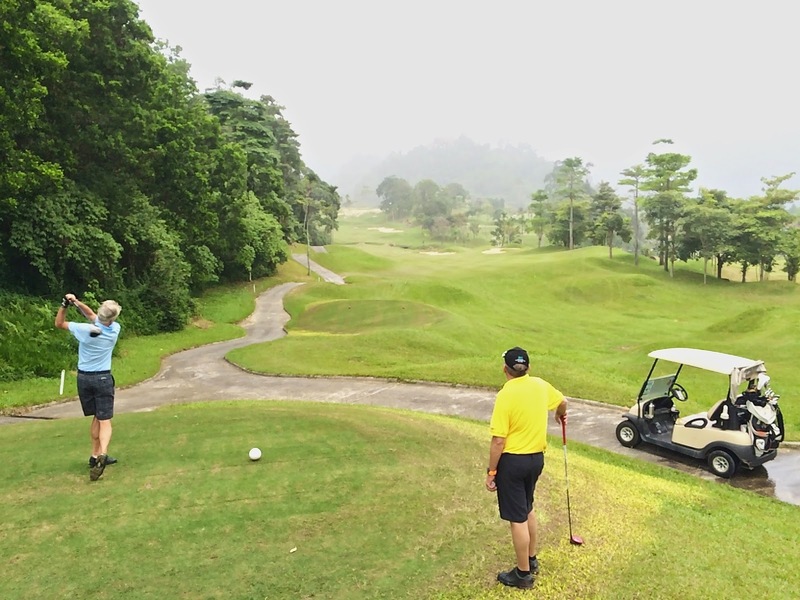 Bukit Kemuning was dry for a change and the weather fine so it was a pleasant morning as 17 Cannons set off from two tee boxes at around 8:00am. 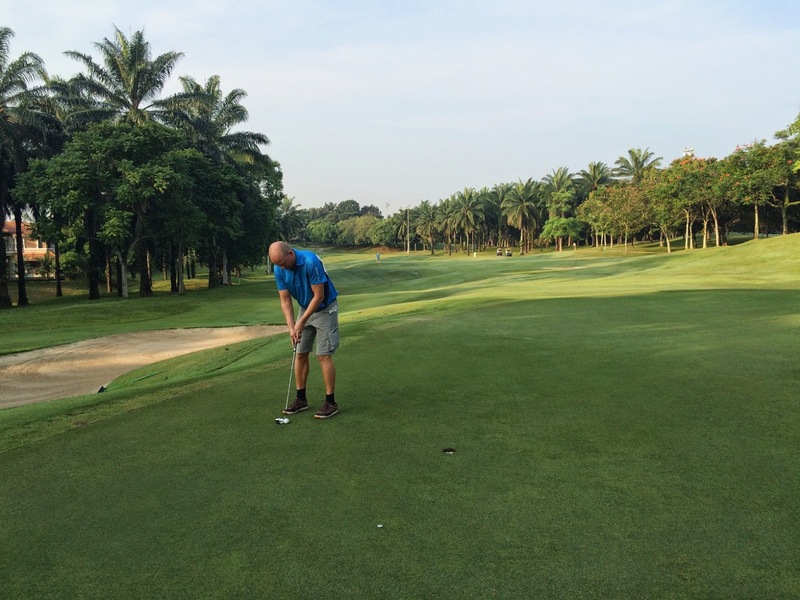 Course condition was quite good although the greens on the back 9 were quite sandy on the first few holes and most greens were a little unpredictable and bumpy (still didn’t explain my consistently bad putting form today!). 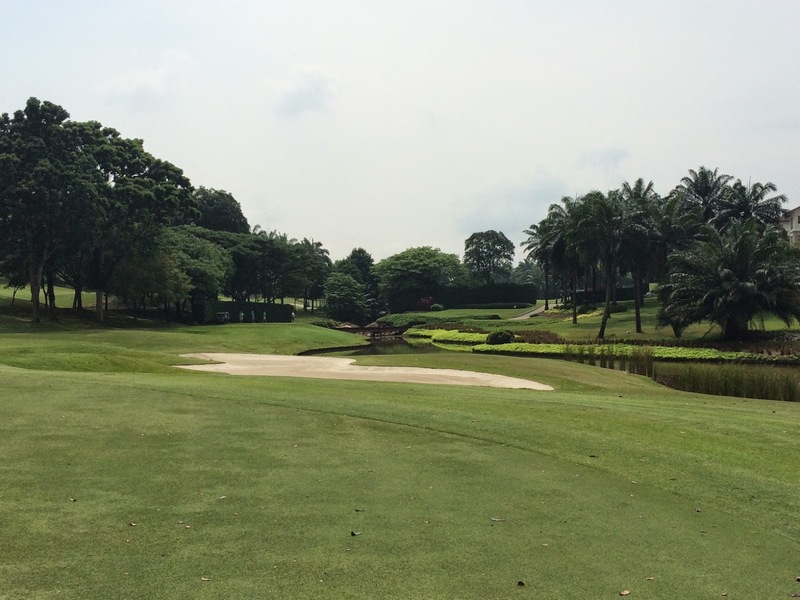 The course plays quite long with the 508m Par 5 16th being in my view one of the most boring holes to play. 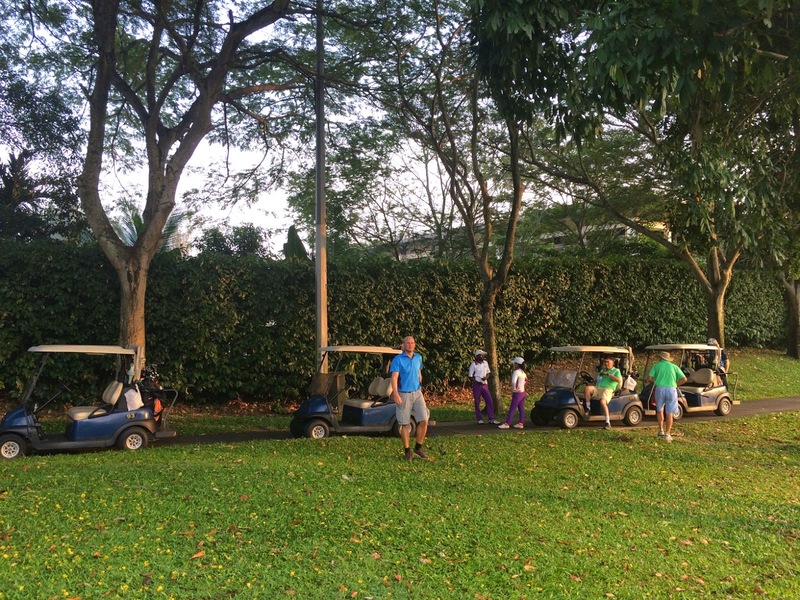 Most of us made good time around the course and we were back to the clubhouse in 4 hours – the last 4 ball however was around 1 hour behind everyone else. 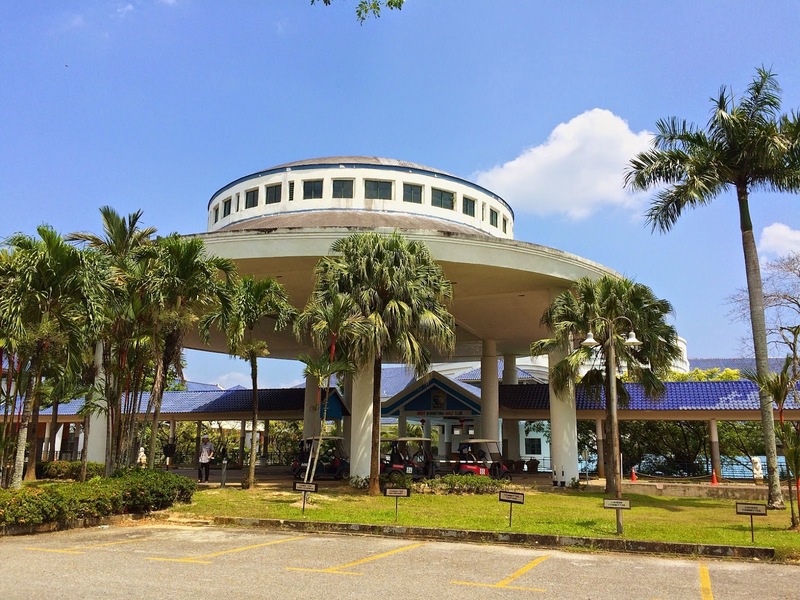 We lunched at the nearby O&S Restaurant (formerly the old Fu Yuen Restaurant) after the game. 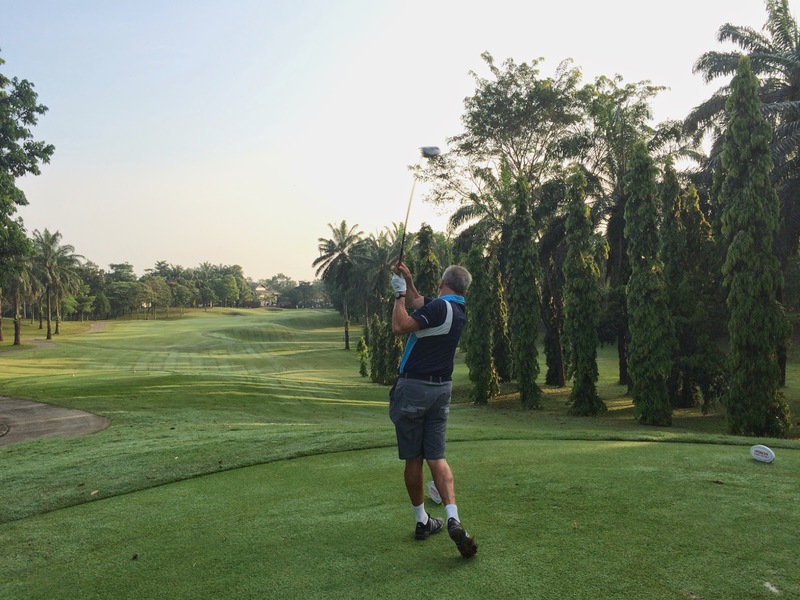 We only had 2 players better than handicap today with the winner Robert Mulliss on 41 points (gross of 99) and runner up was Hans Berger with 37 points and gross of 93. 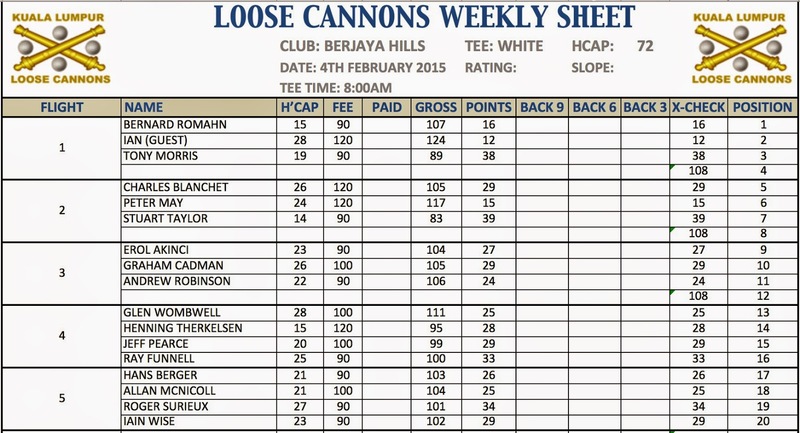 Bets gross of the day was Andrew Cseszko with an 81. 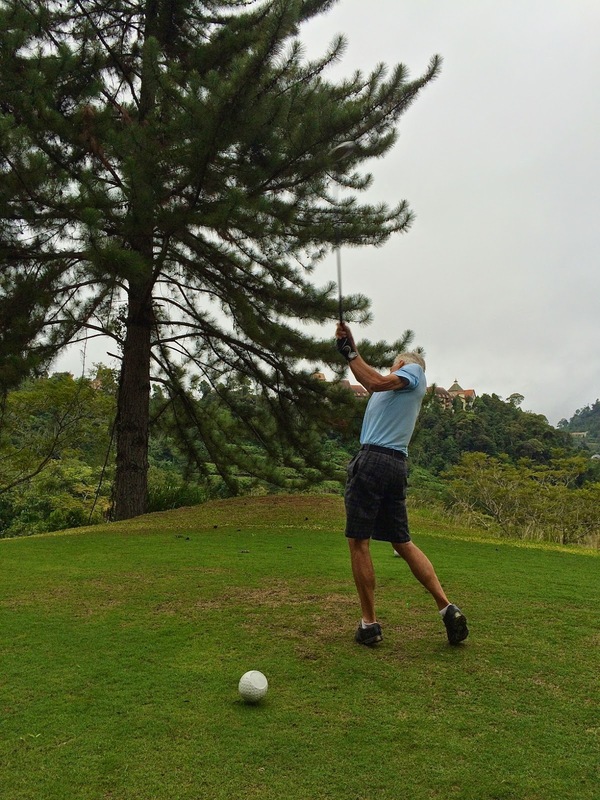 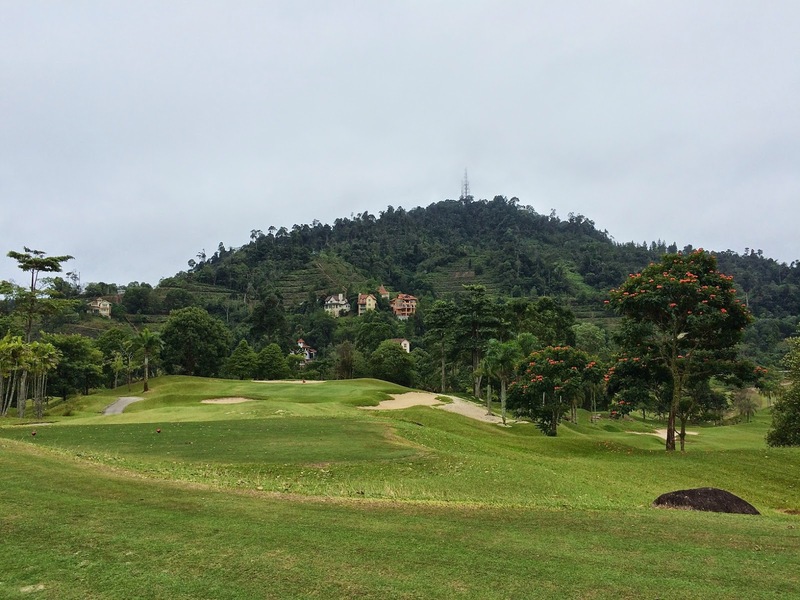 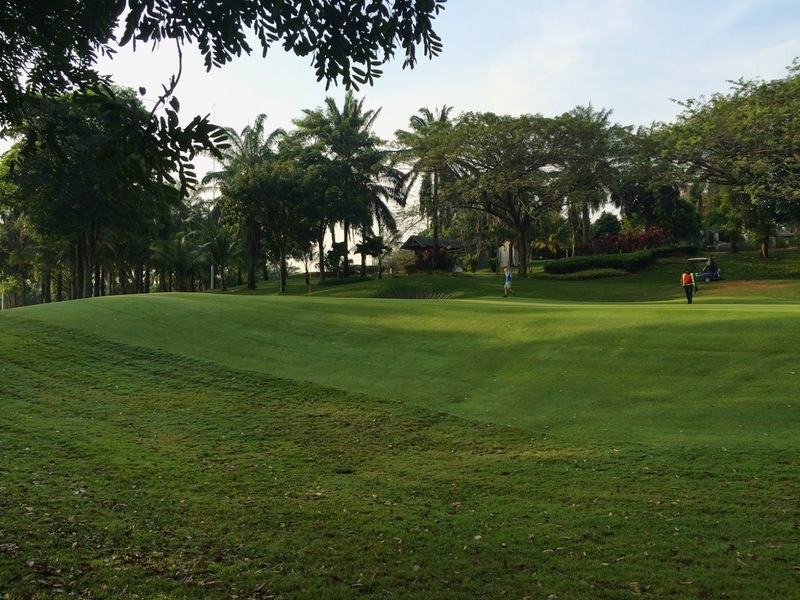 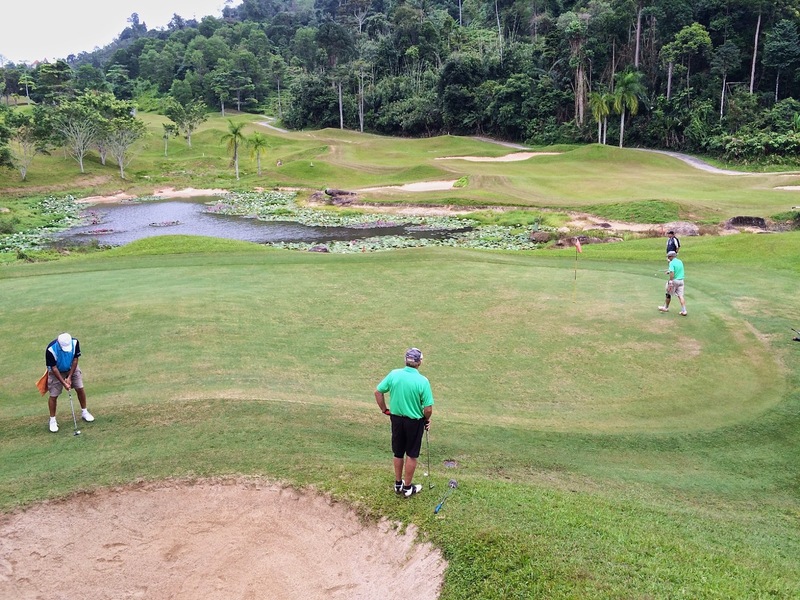 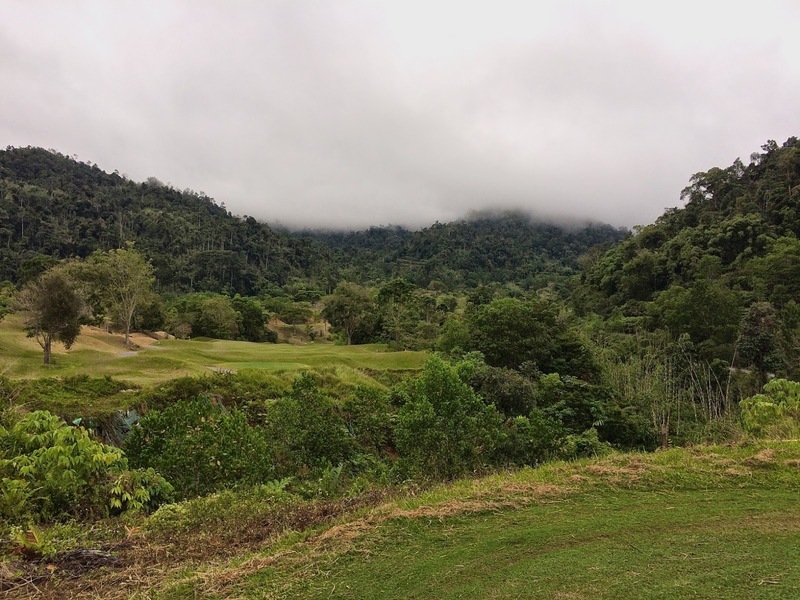 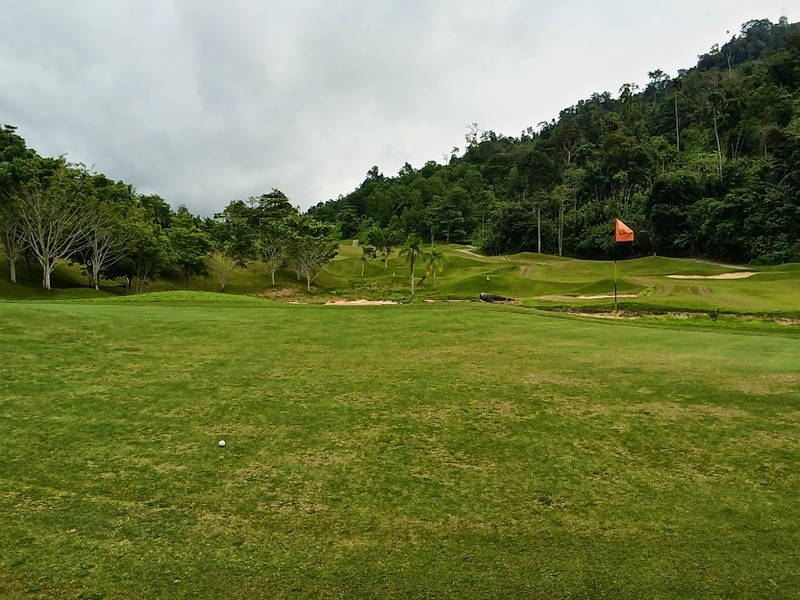 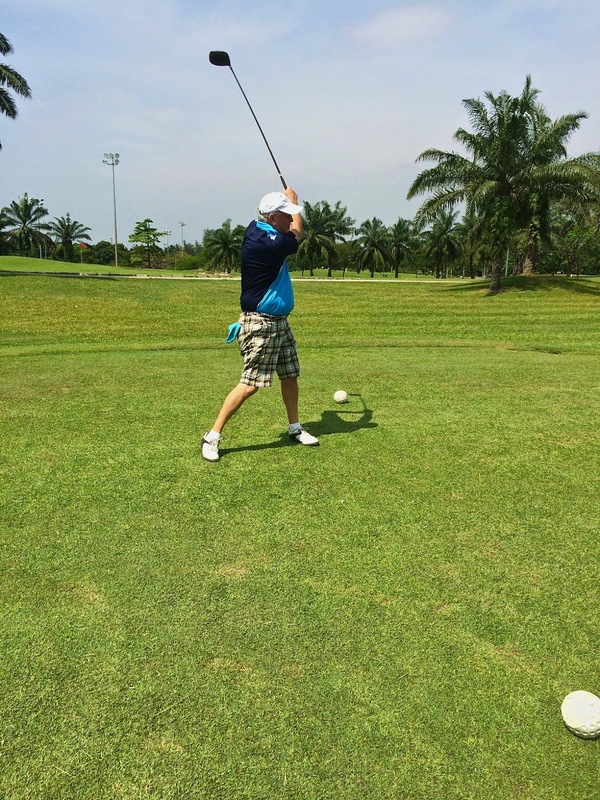 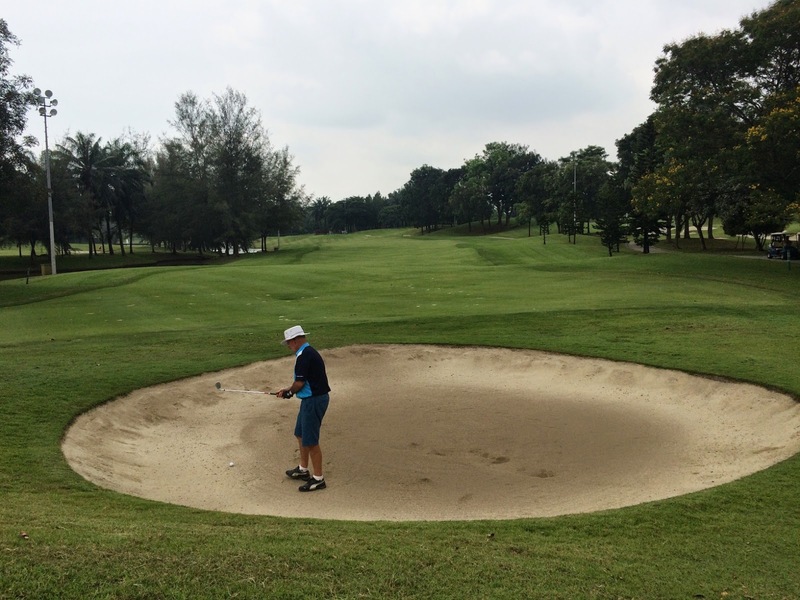 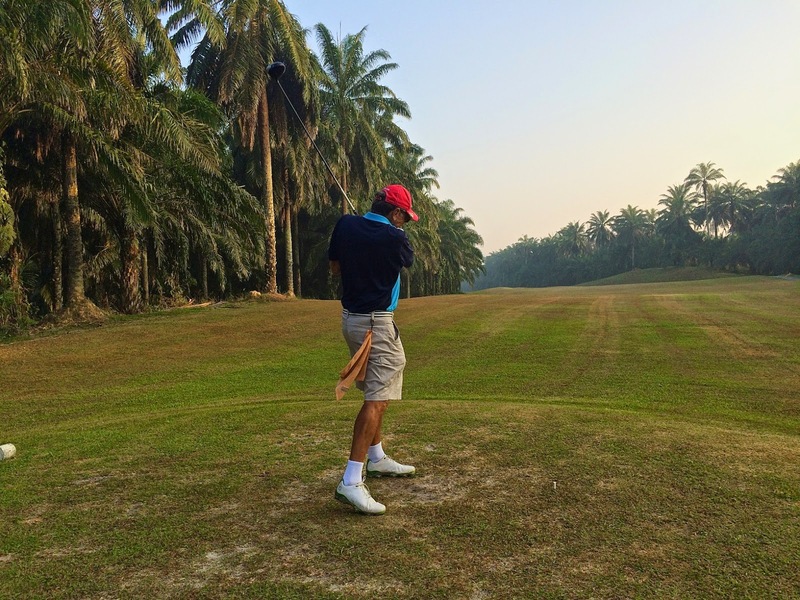 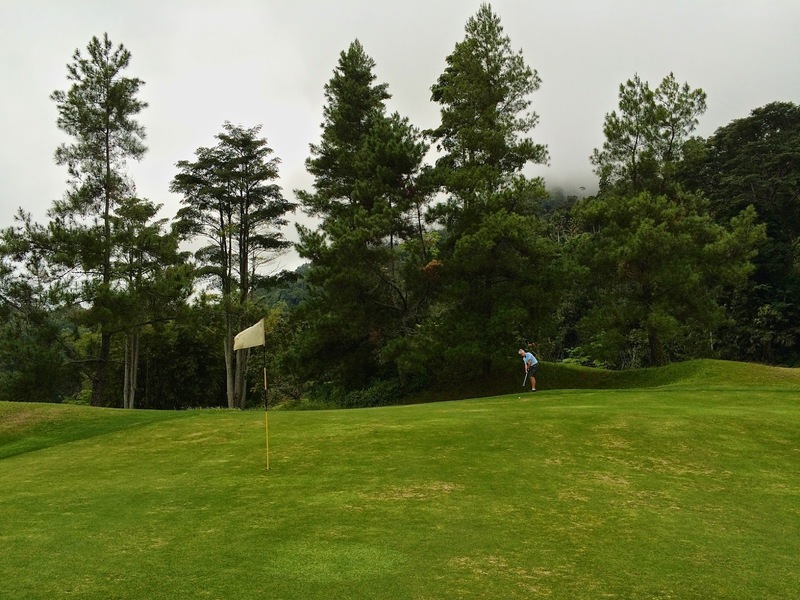 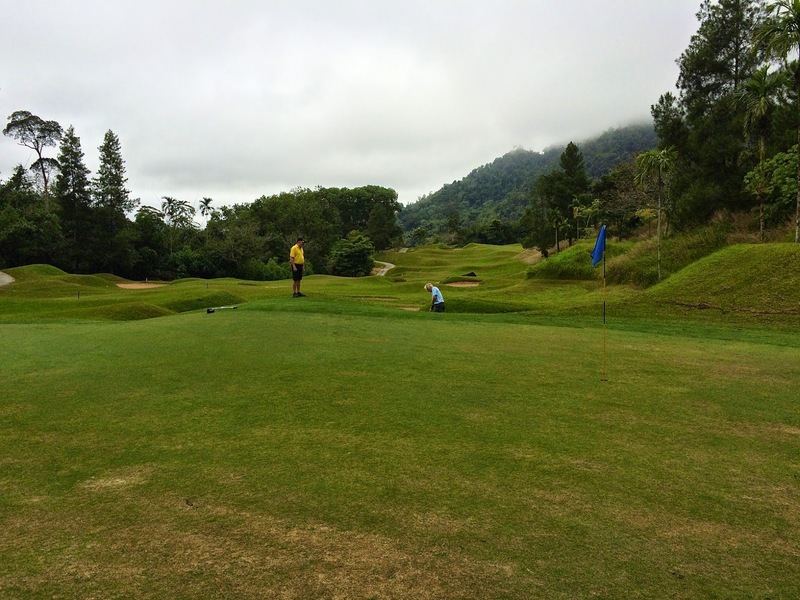 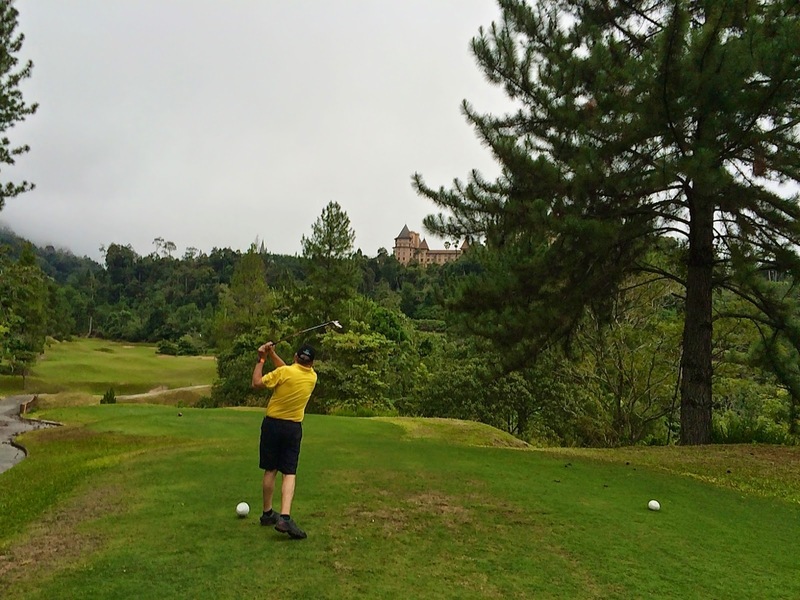 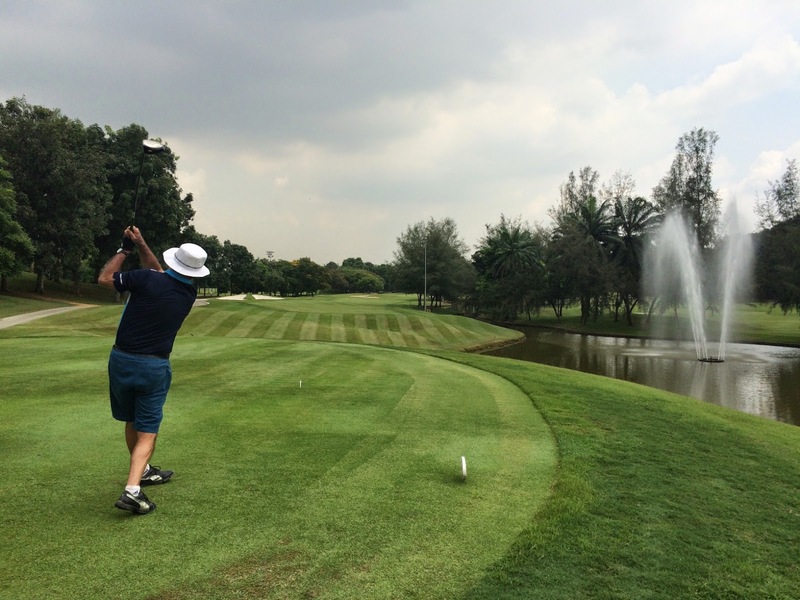 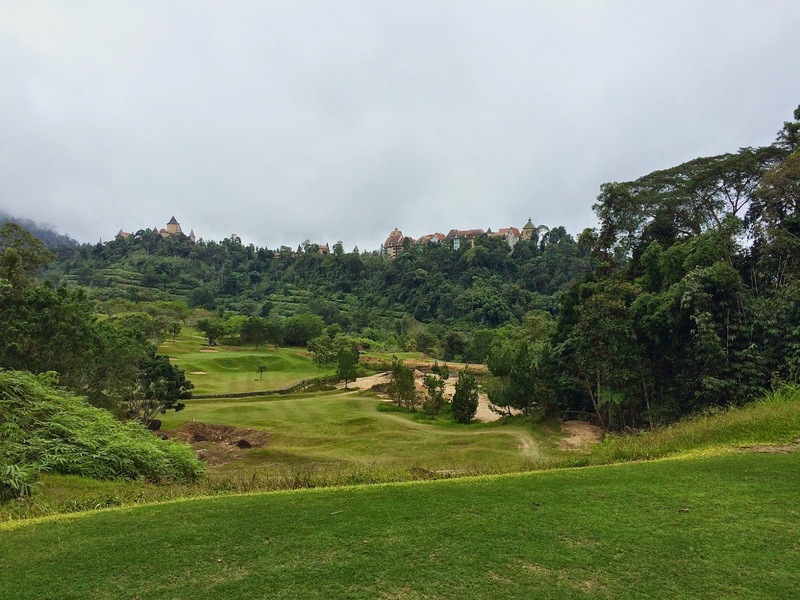 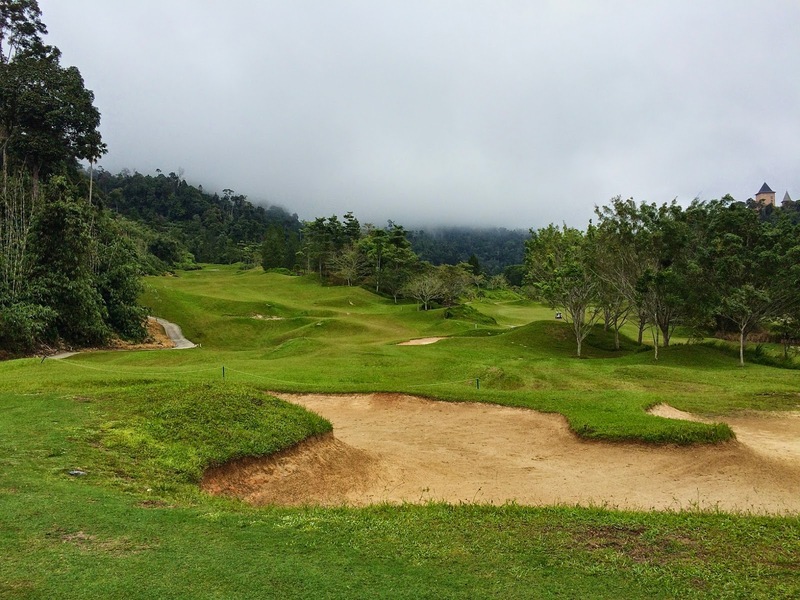 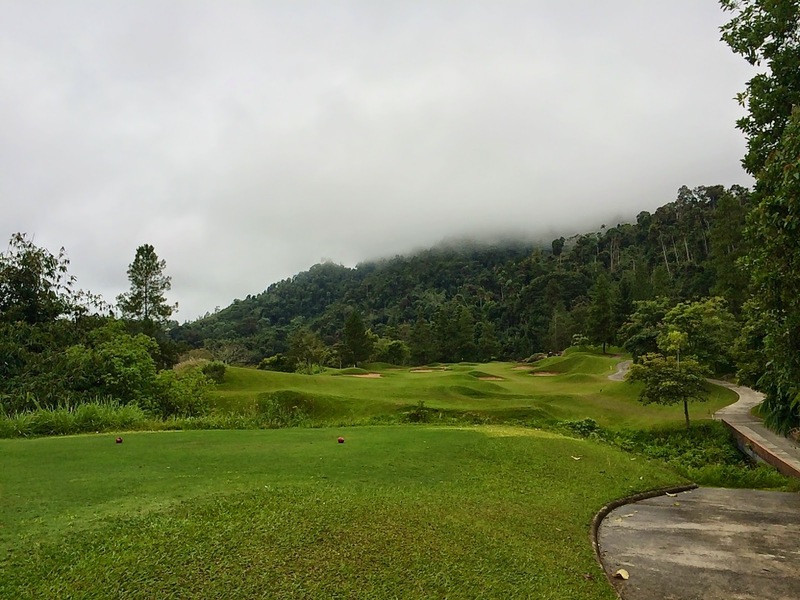 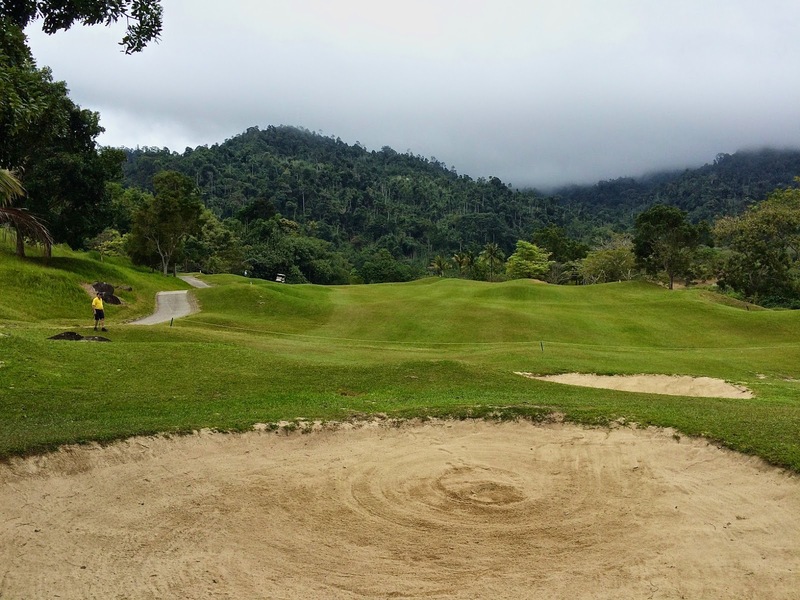 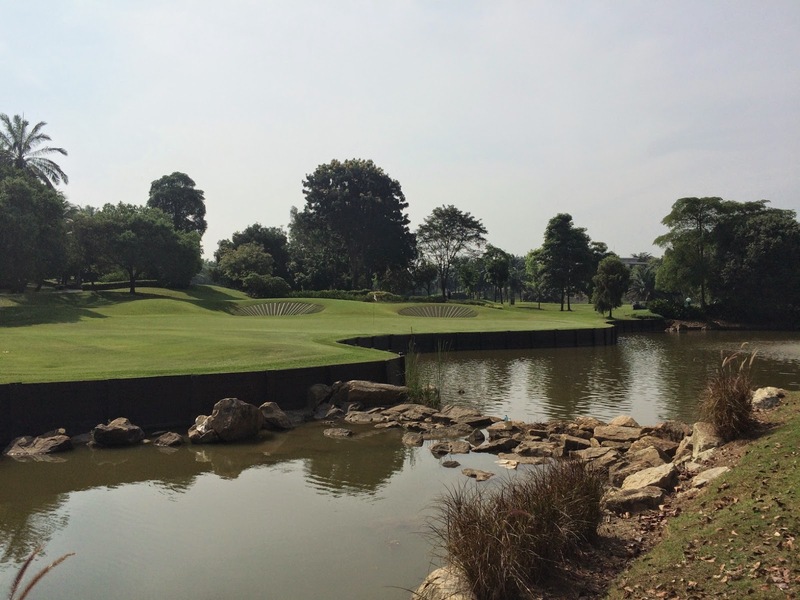 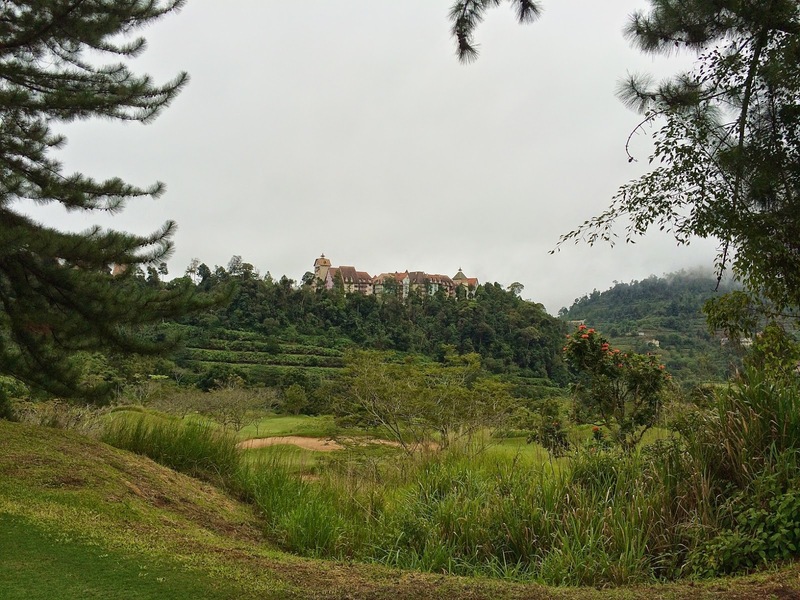 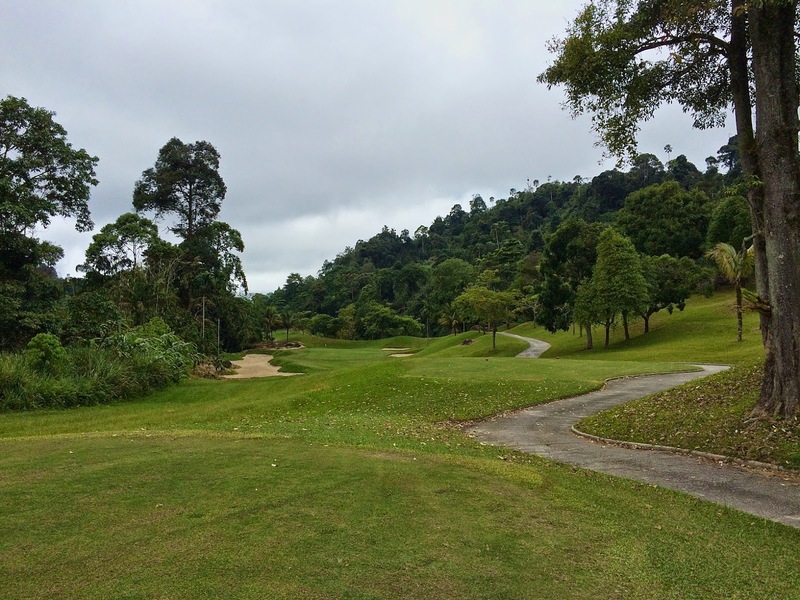 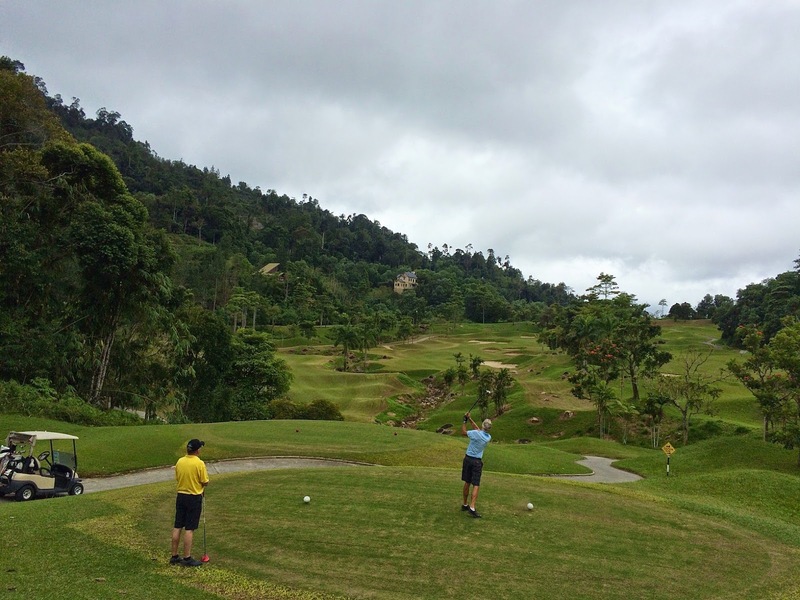 It was a very cool and overcast day at Bukit Tinggi making it a very pleasant morning’s golf …. 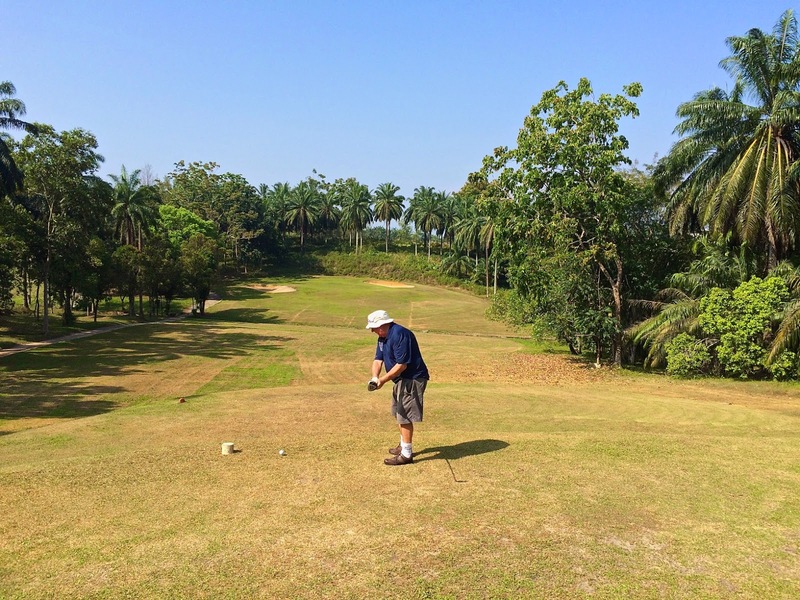 it was almost bordering on the cold side dare I say! 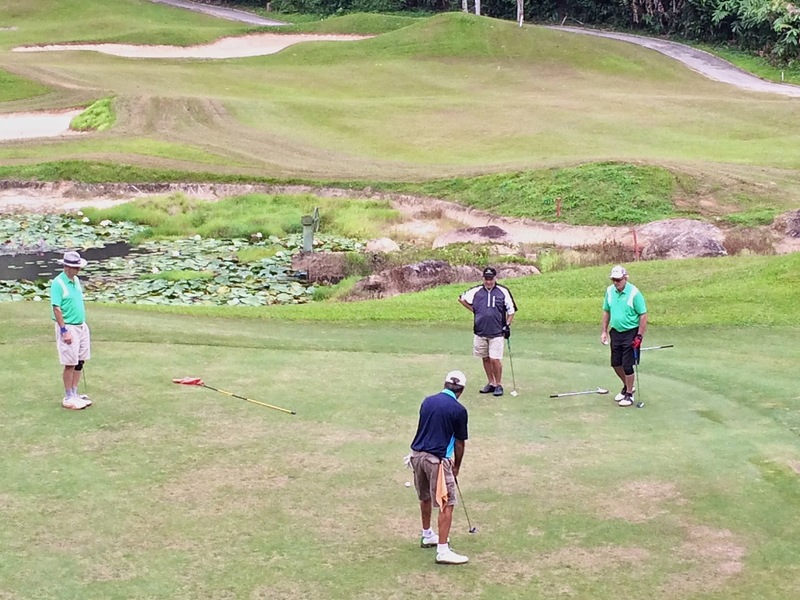 17 players in 5 flights headed out from staggered tee boxes and most made it round by 12:30pm or so. 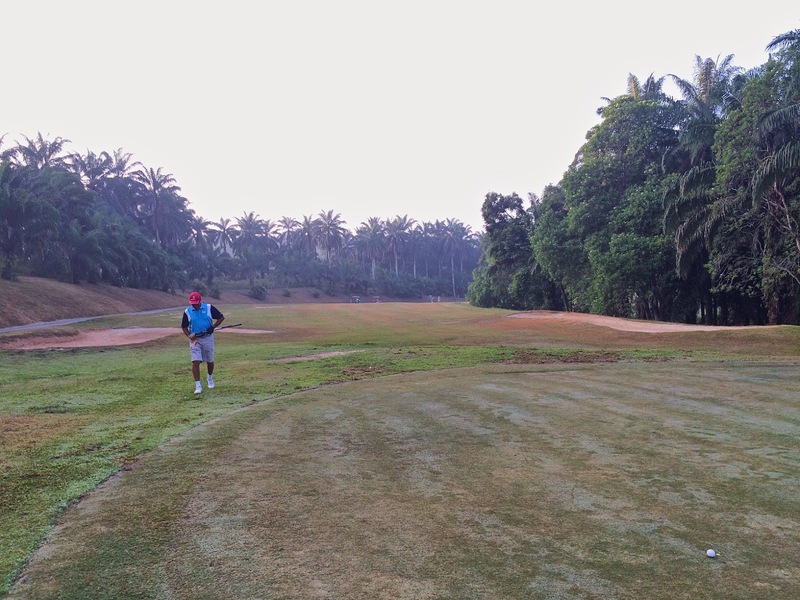 It stayed overcast and cool for the whole morning and in fact during our last few holes we had some drizzly rain. 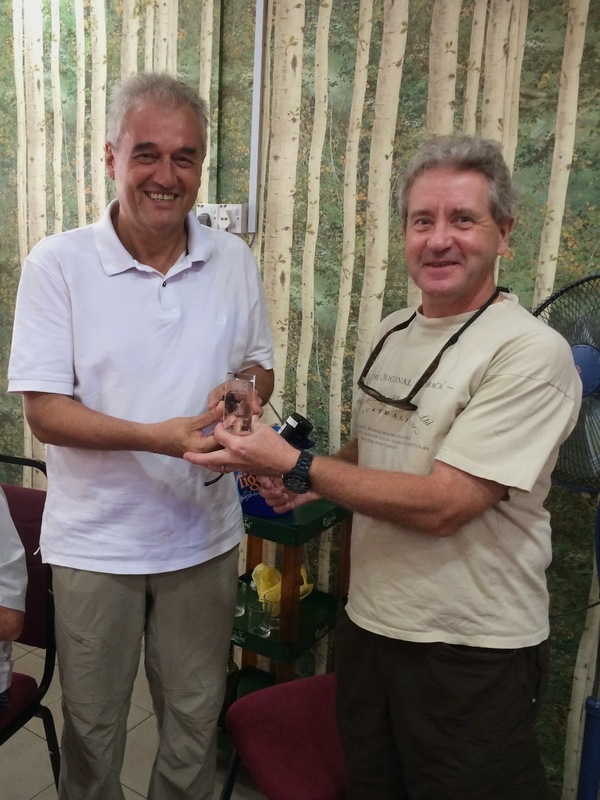 Welcome to a new player this week – Charles Blanchet introduced by Roger Surieux and also a welcome to Tony’s guest Iain visiting from UK. 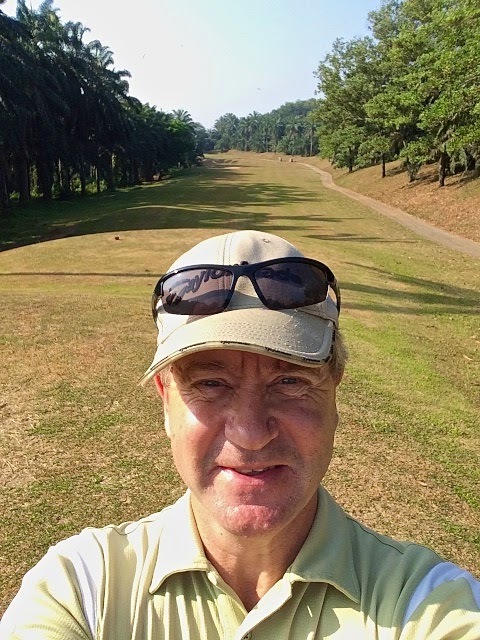 A big welcome back to Glen returning to Loose Cannons after a lengthy period off convalescing from his appendicitis op. 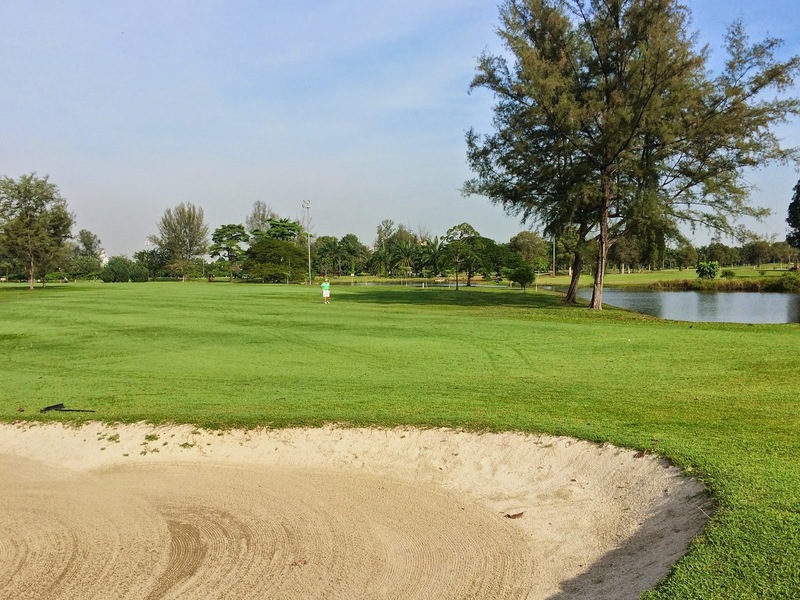 The course was unfortunately looking somewhat untidy and unkempt and the greens a bit bumpy so is really in need of some attention. 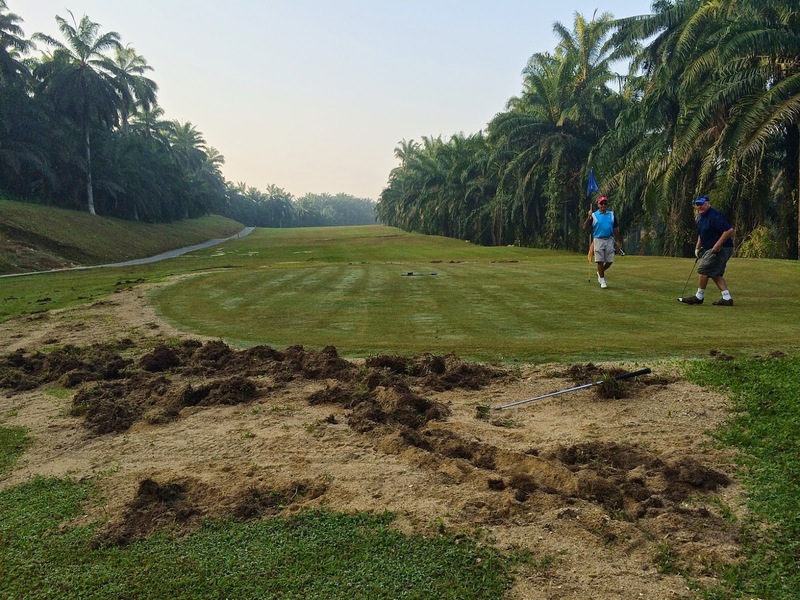 They seem to be digging up and clearing many areas next to the course which makes it look unsightly. 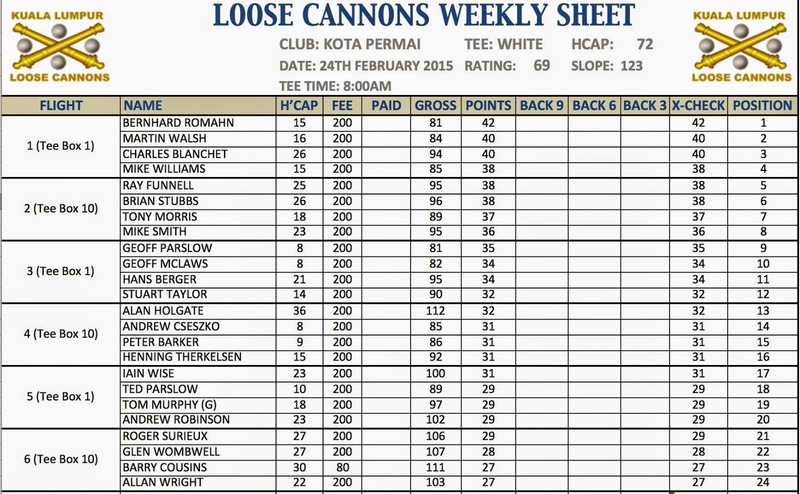 After the game we headed back down the hill to Kampong Bukit Tinggi and Restoran 126 for some lunch and beers kindly sponsored by Allan McNicoll who was celebrating his 100th game with Cannons.